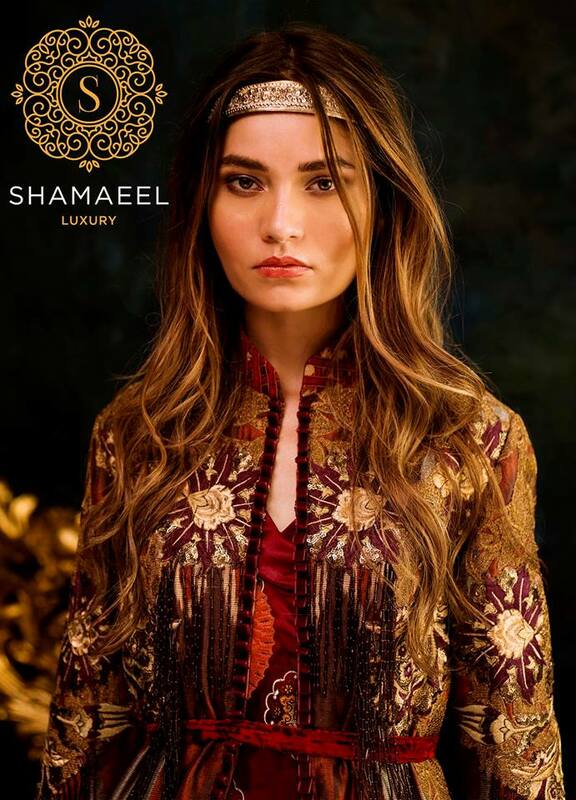 Equipped with great grandeur and luxury Shamaeel Ansari couture brings you the best of the rich cultural heritage of Pakistan. 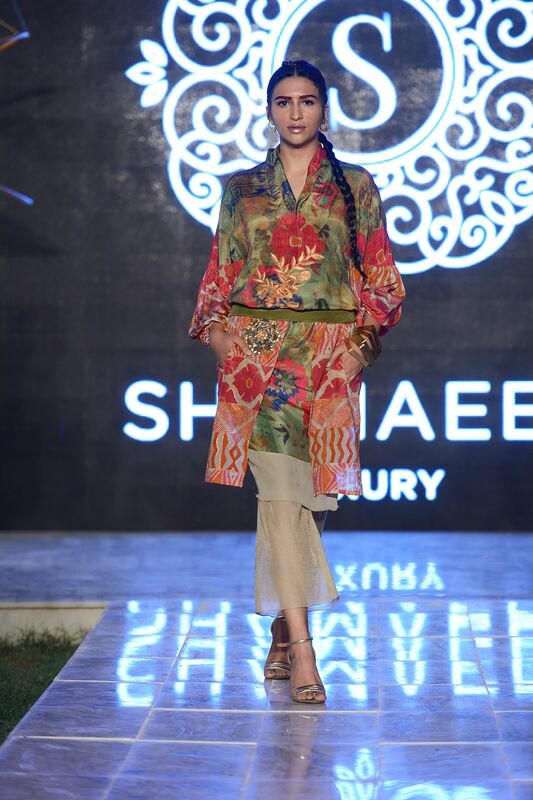 With her strong taste in fashion, super creative mind and a peculiar eye for details, Shamaeel has been setting several milestones in the Pakistan Fashion Industry. 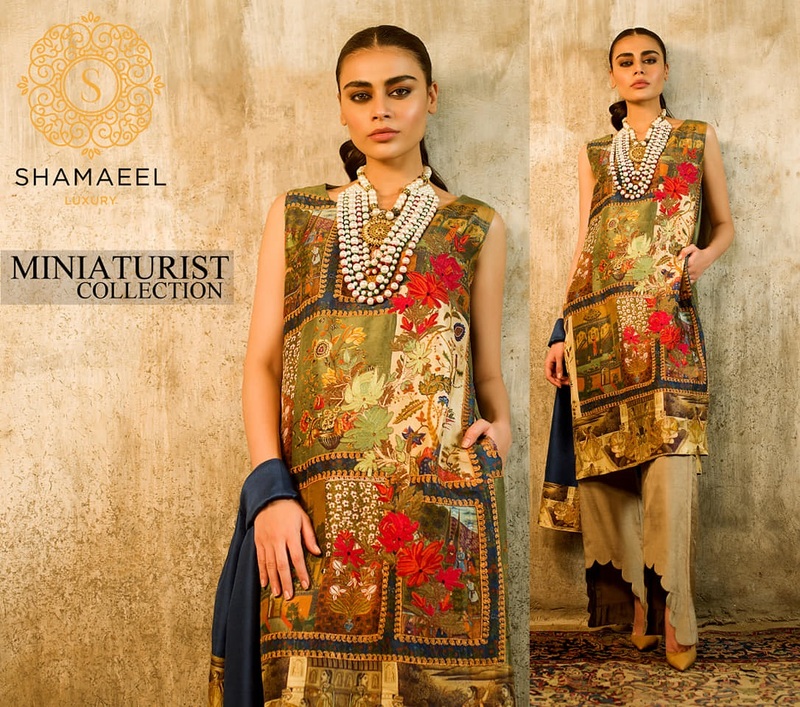 From a great many accolades to the best-ranking brand privilege, Shamaeel Ansari has garnered all the good repute for rendering her great services in the field of fashion. 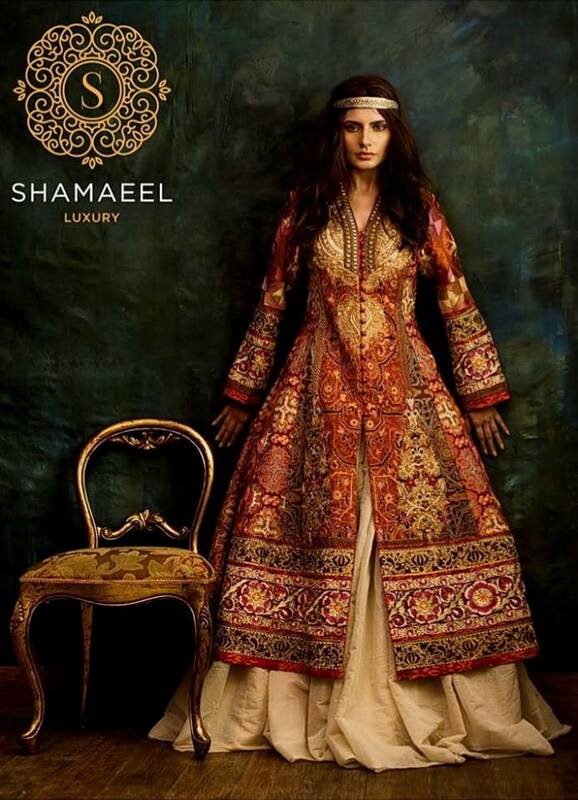 Shamaeel Ansari Brand is backed by the sheer creativity and talent of the lady Shamaeel Ansari herself. Like every year, the latest hits of this clothing line are making news in the fashion circles of the country. 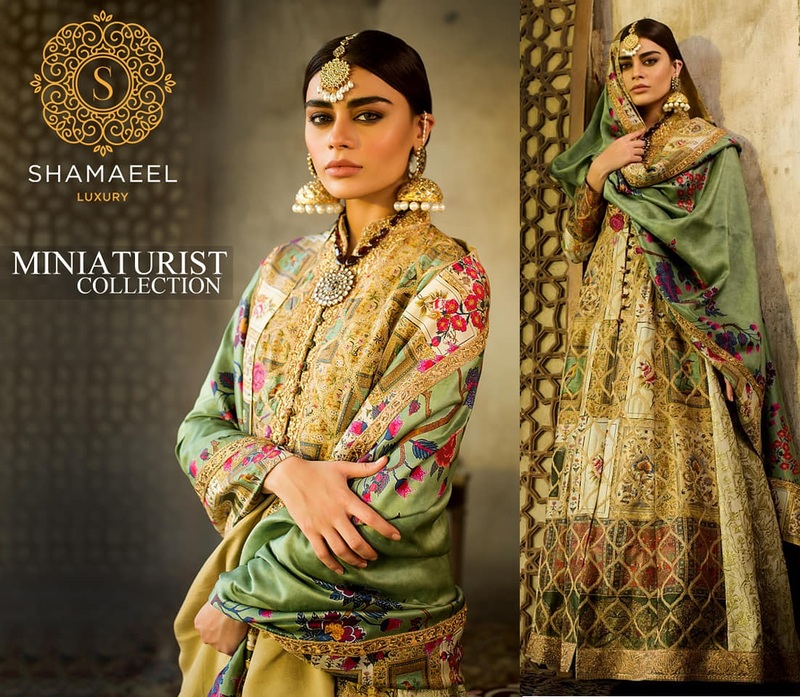 Since we all have been waiting anxiously for such a vivid and vibrant display of colors and embroideries, here comes all the new series of dresses designed under the label of Shamaeel Ansari. 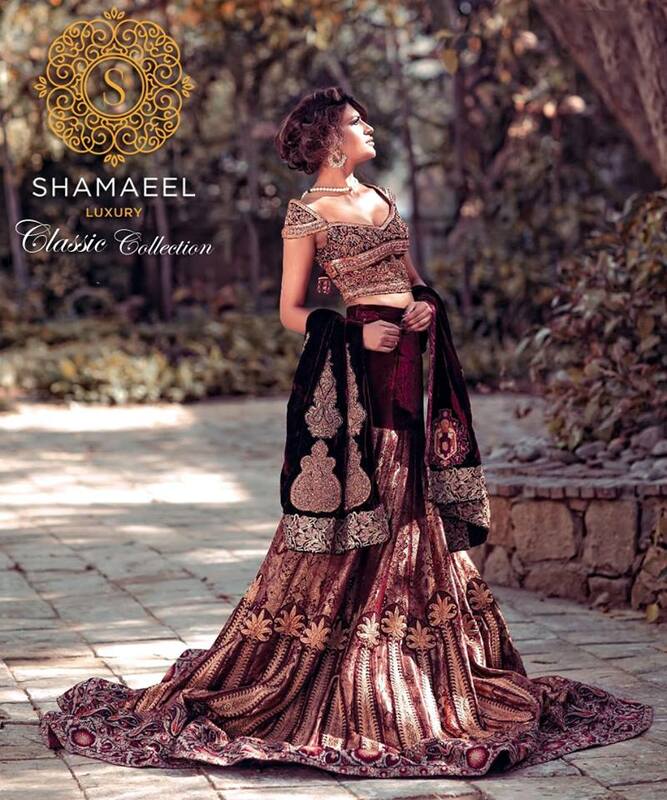 The time we all have been anticipating for is finally here, the exclusively designed Shamaeel Ansari latest couture is here to surprise us with the ultimate display of hues and style. 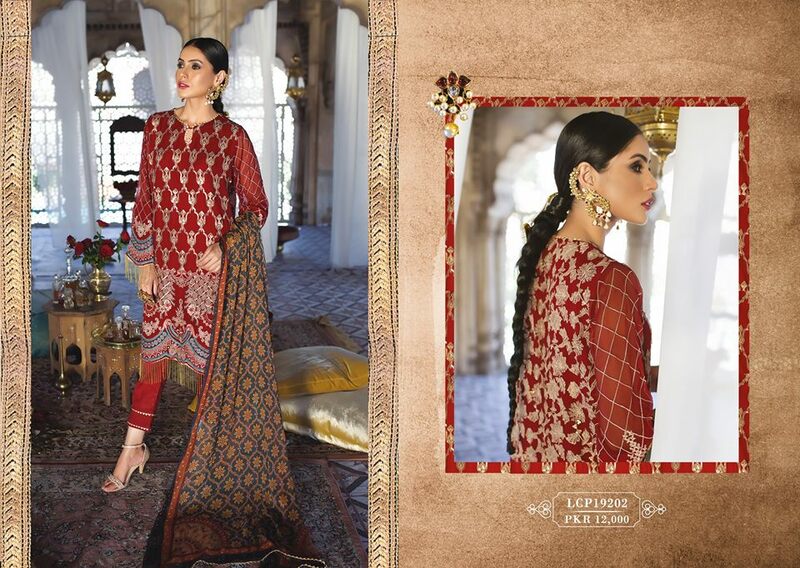 The astounding maroon shade in all those pieces will move your hearts, and the cuts and embellishments are largely supporting the theme of the series. From tops to the bottoms, everything about this new arrival is distinctive. Jackets are certainly put back on the front line where they are finely embroidered with amazing thread and applique work. Wrap dresses and bottom fewer tunics also made a part of this series. 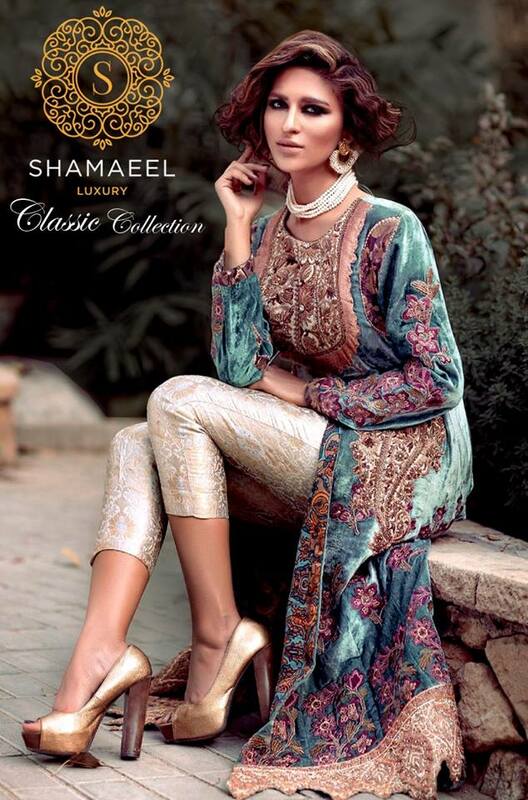 Fanned sleeves in light chiffon was another reflection of Shamaeel’s extraordinary geniuses. In this collection, you will be able to see all the silk, chiffon, net and printed jacquard in best of the cuts. Every piece has a fresh appeal, because of the sharp contrasts and prominent designs. 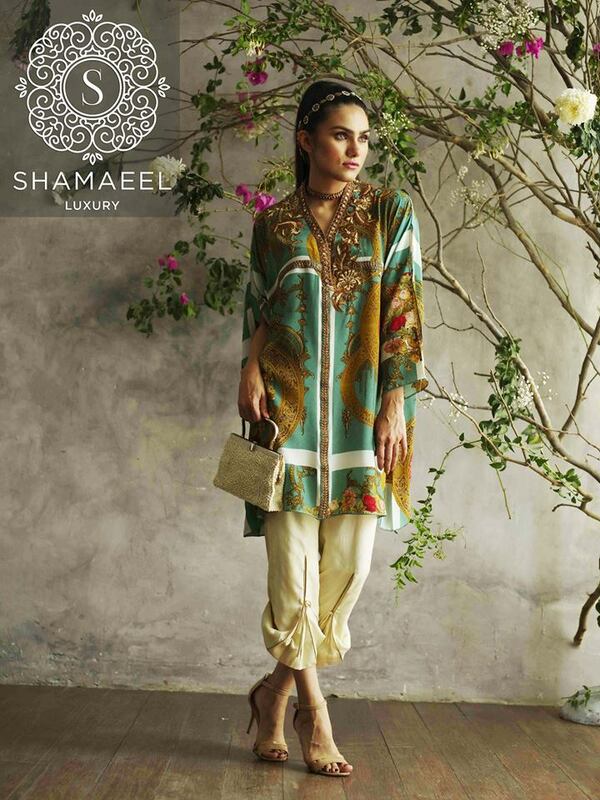 The latest of the Shamaeel Ansari luxury collection takes you to the land of soft color and soothing prints. 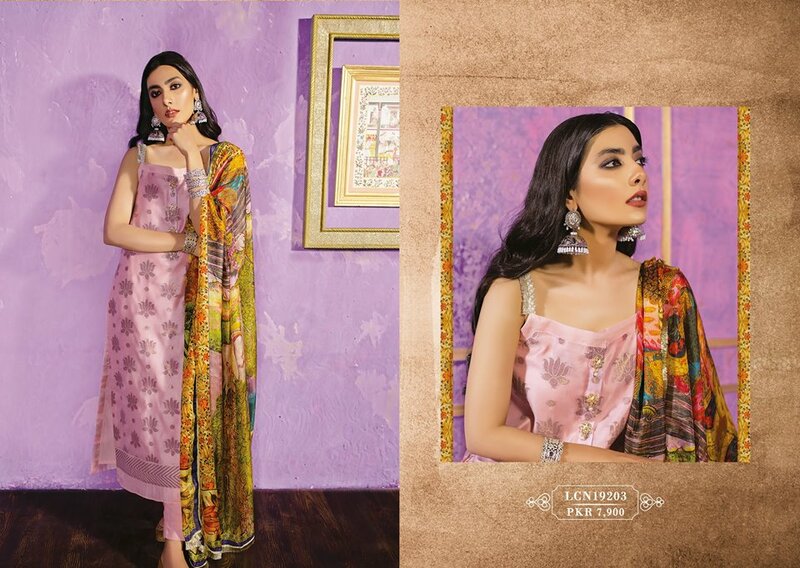 The lightest silk chiffon with amazing feel has been molded into several awe-inspiring designs. Body wrap dresses with pale colored bottoms are making waves in the fashion circles. The captivating ensemble of loose sleeved tops with broad base flappers looks amazing when carried to any occasion. 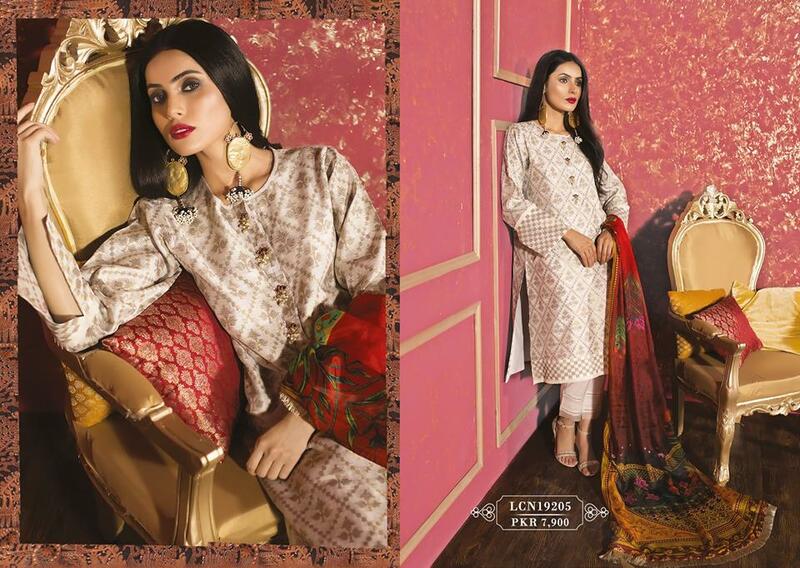 This luxury collection is there to cater to the needs of women who carry style with quality. 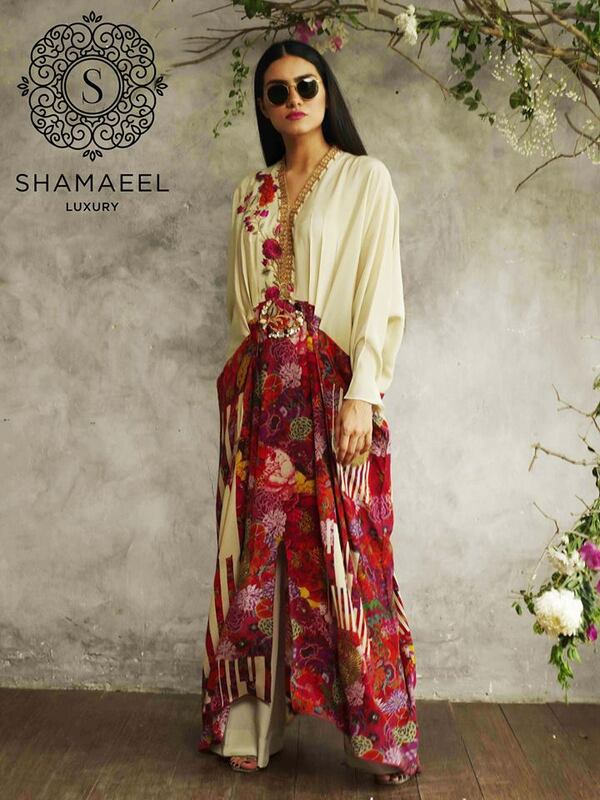 Shamaeel has given a new identity to the wrap style while giving all the tops a bad and loose touch along with a prominent tie knot on the waist or right below the waist. The variety of these dresses are customized in several different ways; some are paired with matching uppers, while others carry different forms of broad-based trousers. Carry these dresses with charming high heels and create magic with your entire outlook. The main concept behind the luxury collection has always been to create a spellbinding style using the softest of colors. Just like the last year’s epic luxury collection, the focus remained on the mellow color and decent outlook. 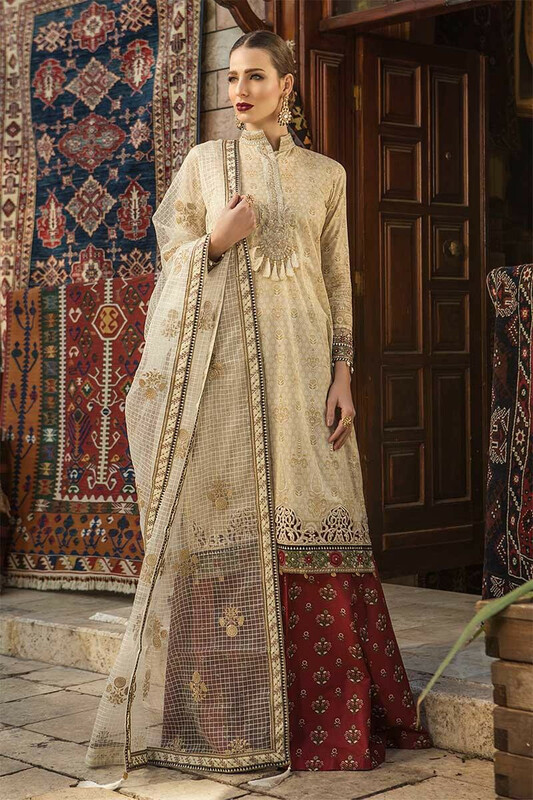 You won’t be finding any of the heavy embroideries over the dresses. 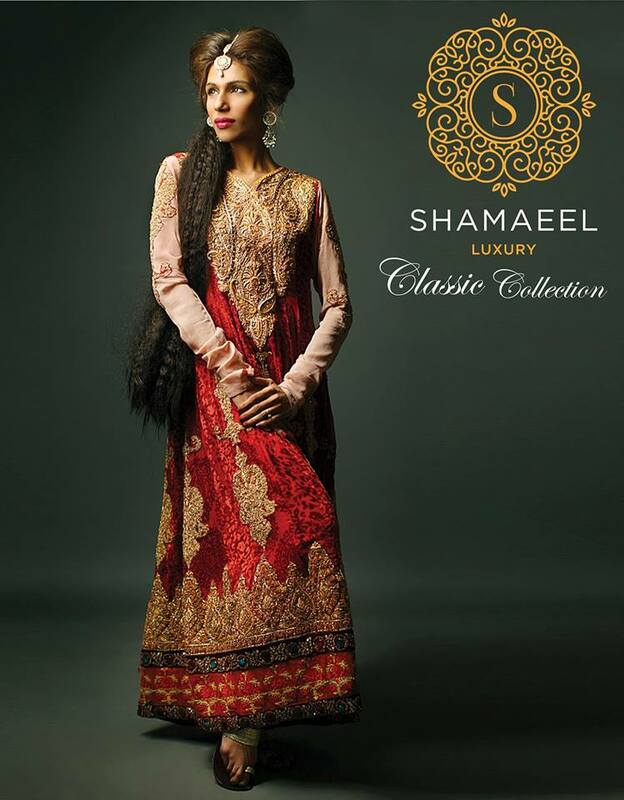 That is why the luxury collection by Shamaeel Ansari is best to carry out to parties and occasional celebrations. The cuts and stitches of these dresses are enough to make the outfits look incredibly unique and novel. 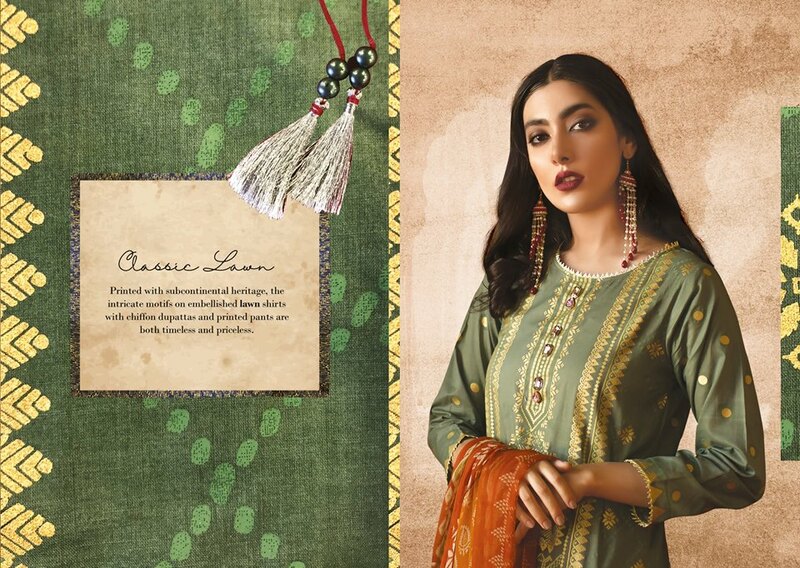 The latest luxury collection 2019 will catch you by its scenic prints. Every piece of apparel has a picture to paint in front of you. It is this use of archetypal landscape imagery that makes this luxury collection fascinating. 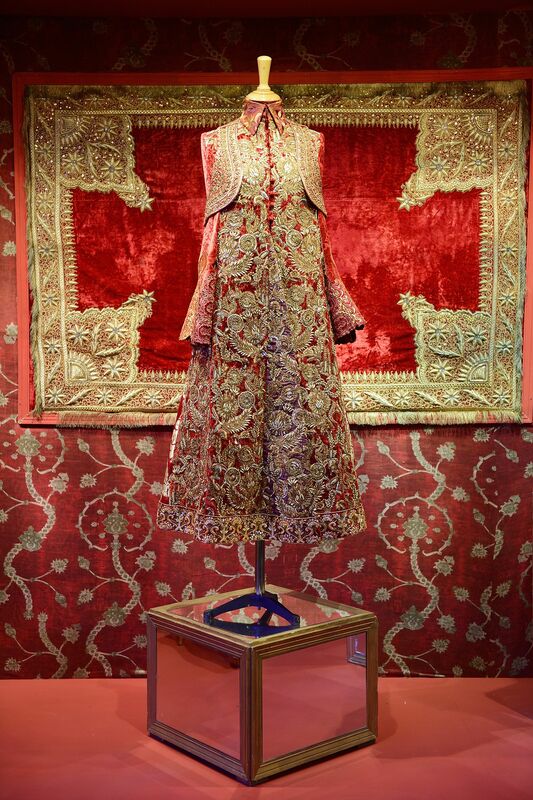 These pretty velvet dresses with fine details and adornments will blow away your hearts. Check out this remarkable assortment. 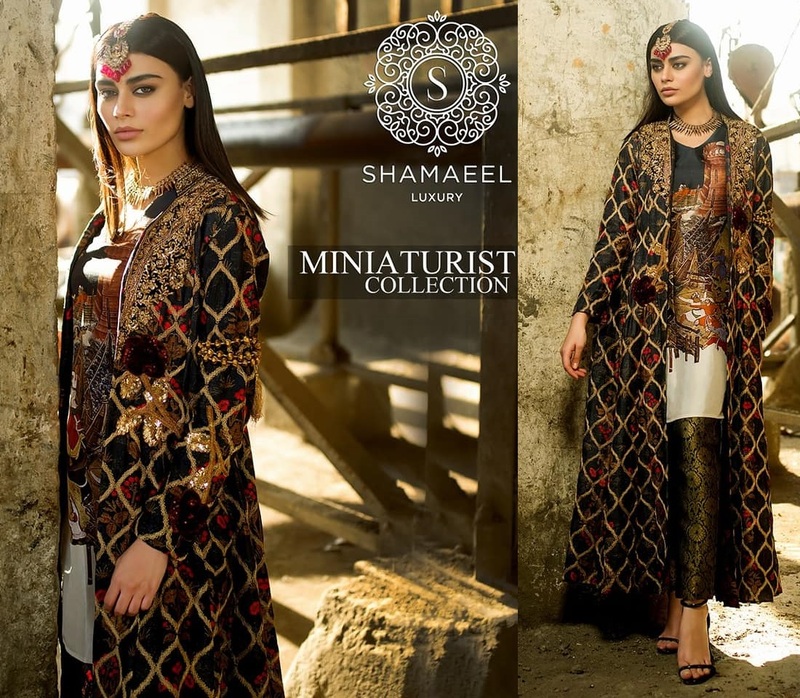 The pret collection by Shamaeel has always been setting new precedents in the fashion world while bringing ease and comfort together with style. 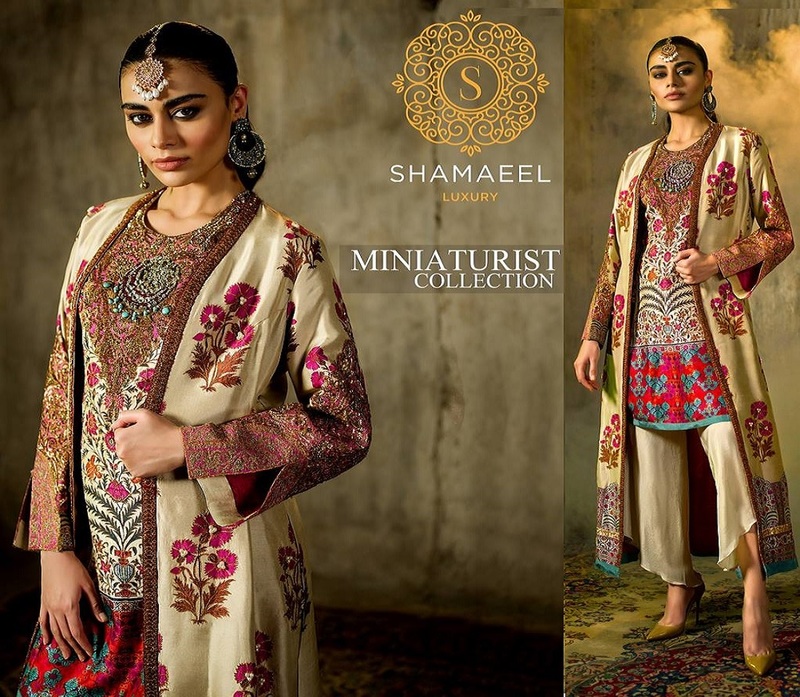 If you want your formal wardrobe to become an emblem of sophistication and supreme style, then the latest pret collection by Shamaeel can be your next fit. Wild colors, sharp cuts, and loose wraps are the three most distinguishing features of this collection. Whether you want to carry fashion in high boots or in retro silhouettes, there is one good option available in this couture to meet your needs. From long ankle length dresses to embroidered shirts and trousers, every possible stitch style is encompassed in this collection. 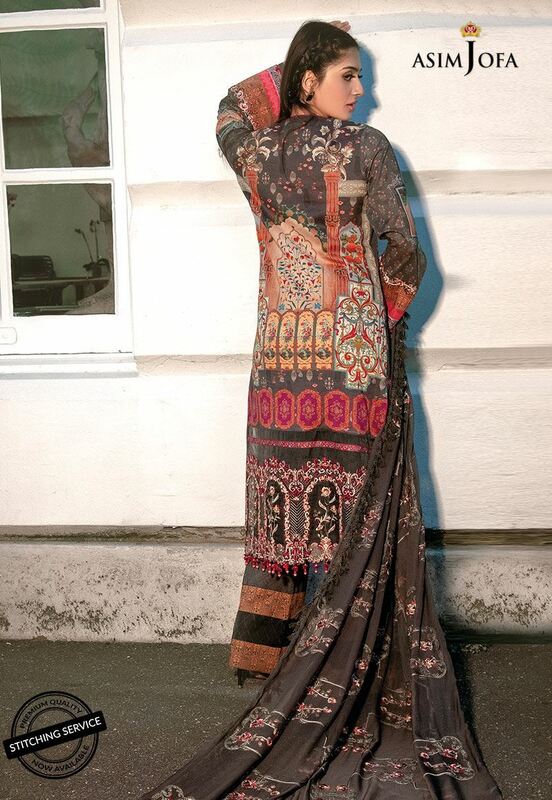 There is a mix of embroideries and prints in each dress, which creates a complete balance. The bridal wear of every great clothing line always takes center stage. It is that art people usually pay the most to look up to. 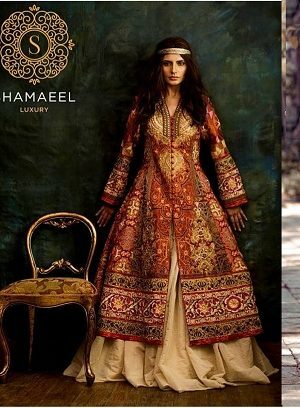 Shamaeel Ansari has a unique approach towards the bridal wardrobe. 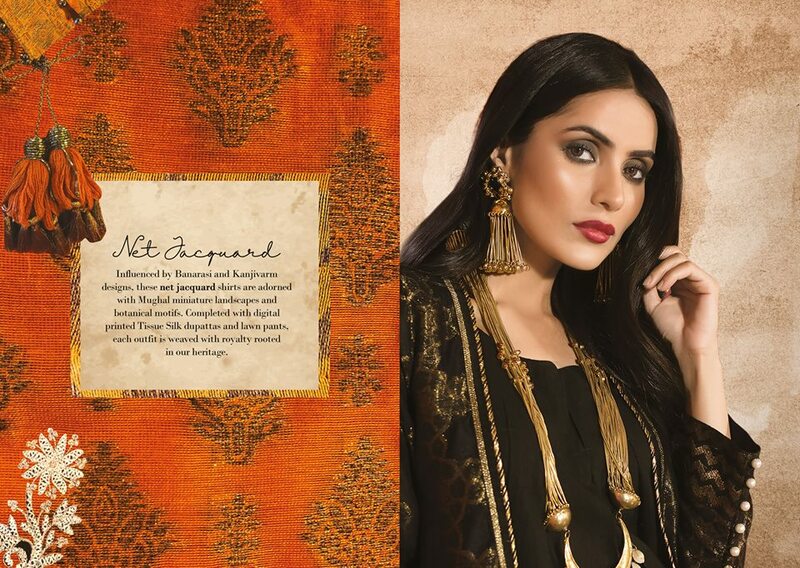 While keeping it all very traditional, she discovers new ways to highlight the richness of our ancient heritage. 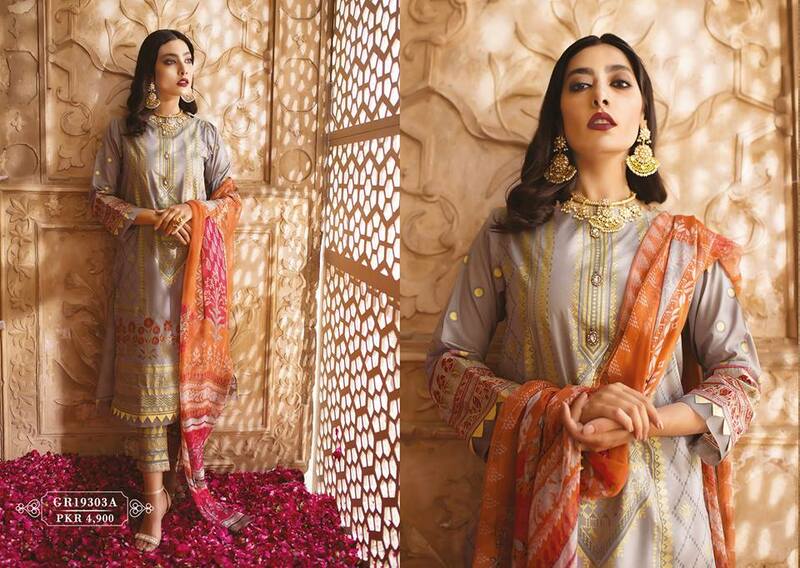 The details of the embroideries and the diversity of the threadwork, dabka, zari, kundan, and pearl work, are the two most inspiring features of her latest bridal collection. 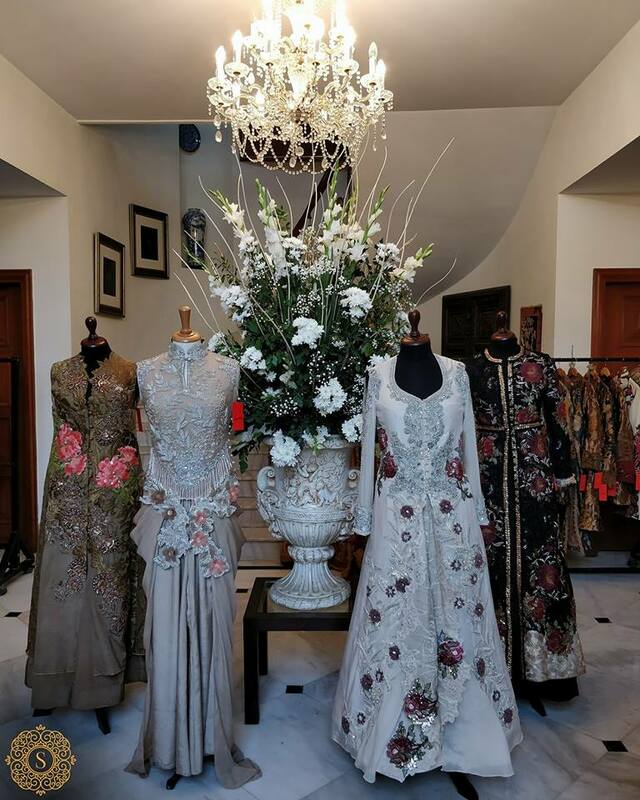 When it comes to style, the entire range represents all the variants of lehenga choli, upper with trouser shirts, ankle length frocks, half jackets, and maxi gowns. 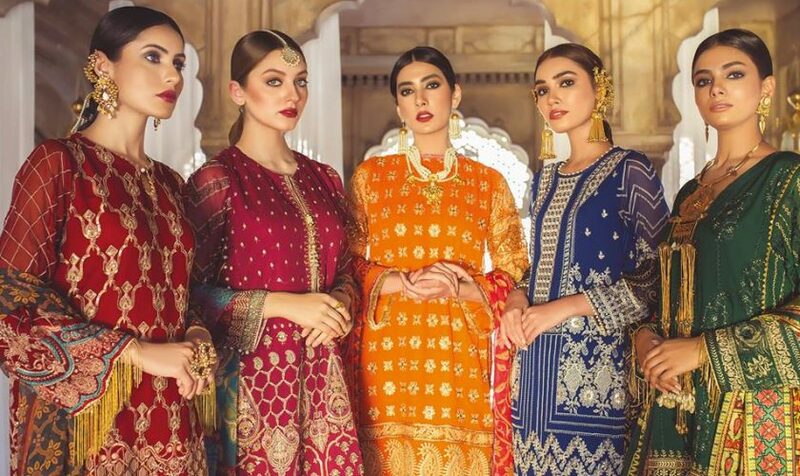 There are all extremes of hues available in this collection; this diversity of colors helps all the brides to carry the style for all the wedding occasions including Barat, mehndi, reception, engagement. 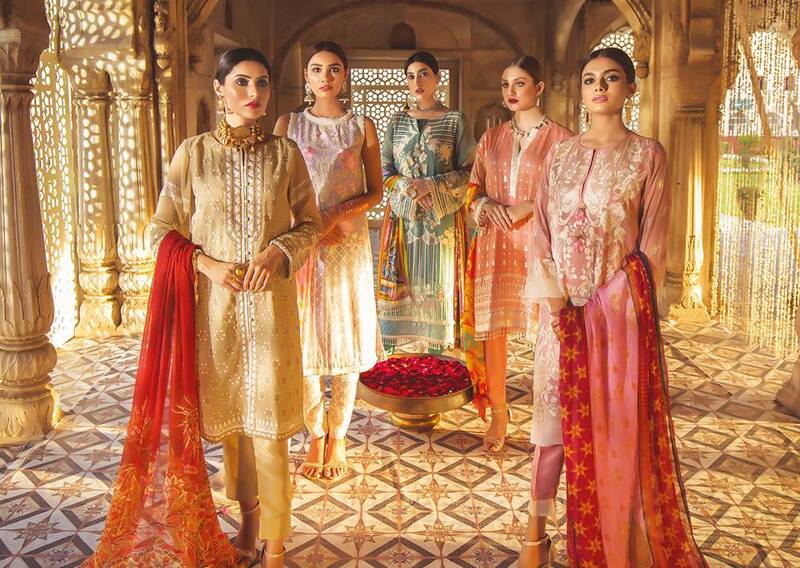 The richly embroidered bridal shawls along the dresses have caught most of the attention after the launch of this collection. 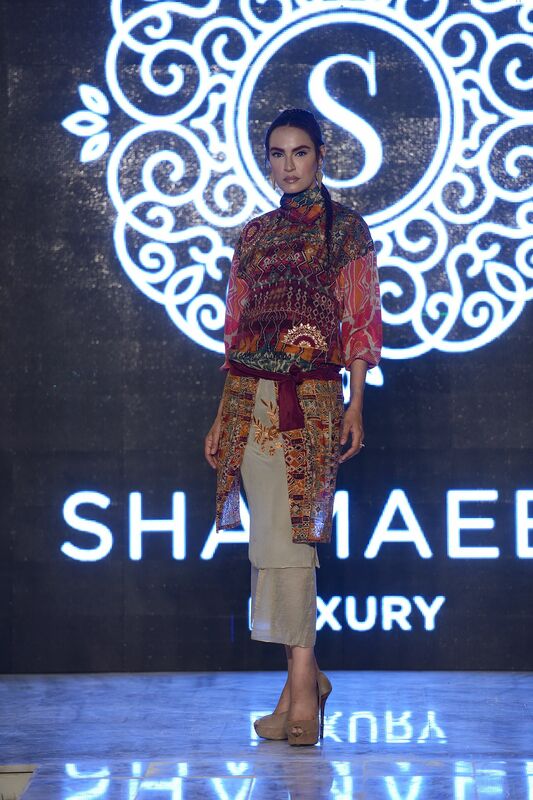 Shamaeel always produced the head-turning designs at the fashion weeks. Each dress and design speaks its own uniqueness and style. Every masterpiece is created with great effort and give pure artistic vibes. Eid is just coming soon; few weeks are left. Shopping is on its way; People are chasing and finding their required designs all over the markets and malls. 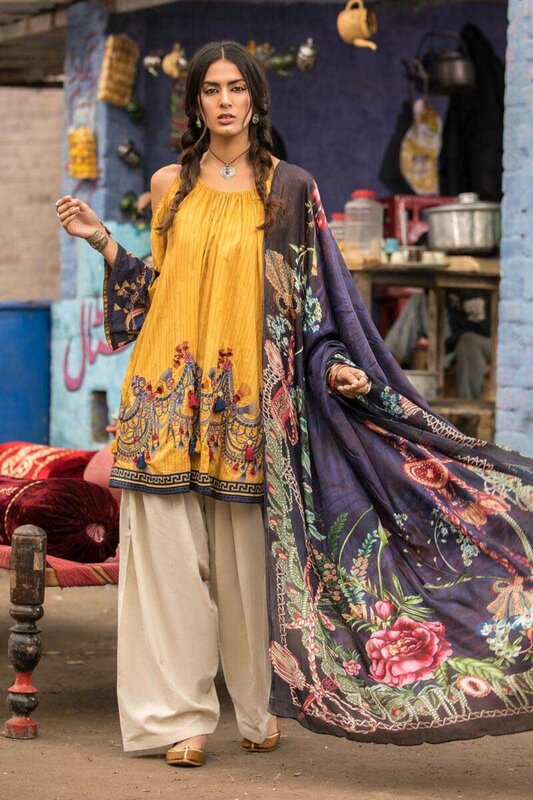 Today we will share the Latest Khaadi Lawn Chiffon Eid Dresses Collection 2019. Many designers are busy in launching their arrivals; some have introduced while some are left. 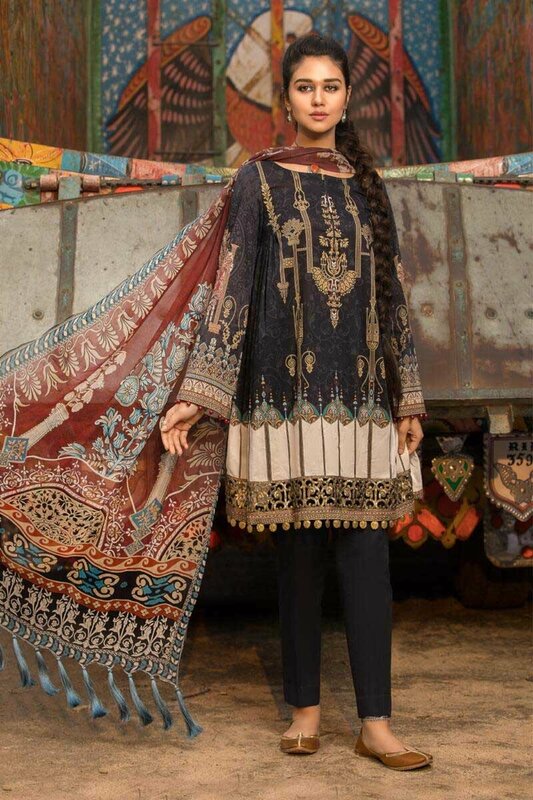 Khaadi, on of Pakistan’s bright name in fashion brand had also unveiled their collection a few days ago. 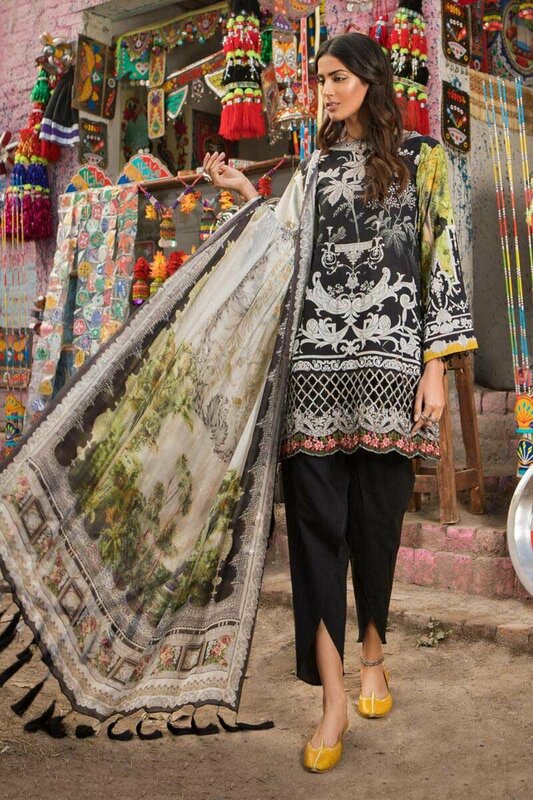 “Khaadi Lawn Eid Collection” is just recently launched after the great success of volume 1 and 2 of summer lawn. Talking about the brand, Khaadi is started in the year of 1998 in Karachi dealing with high-quality fabrics and producing valuable designs. 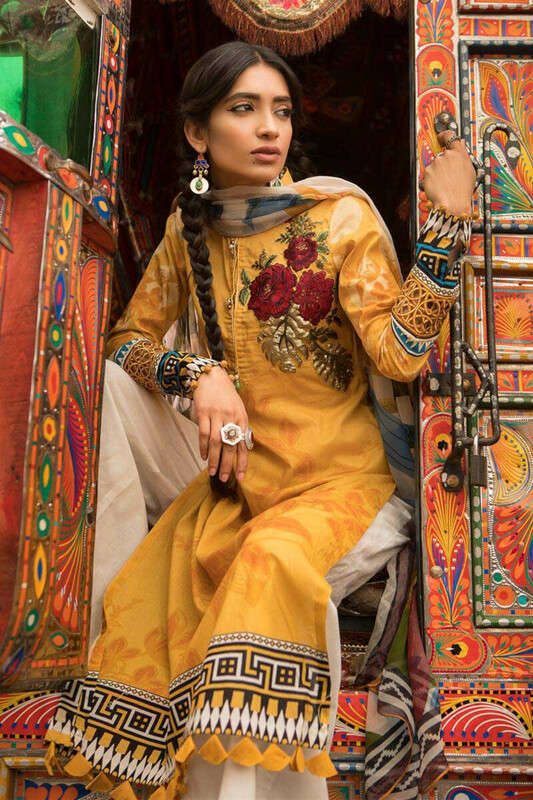 In the start, it deals with an only un-stitched variety of ladies clothes and fabrics but later on started bringing out ready to wear dresses. We are sharing the limited edition festive range. 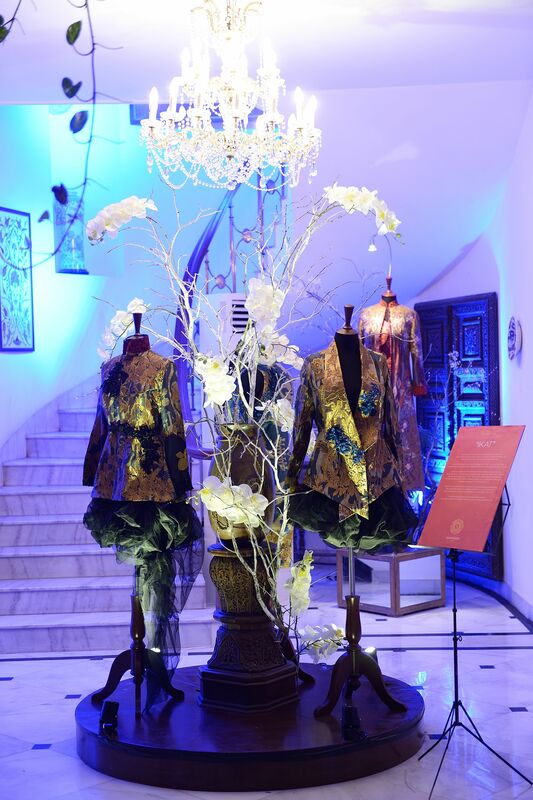 That includes the suits ranging from 4,900 to 12,000 pkr. I hope you will love viewing these marvelous attires. 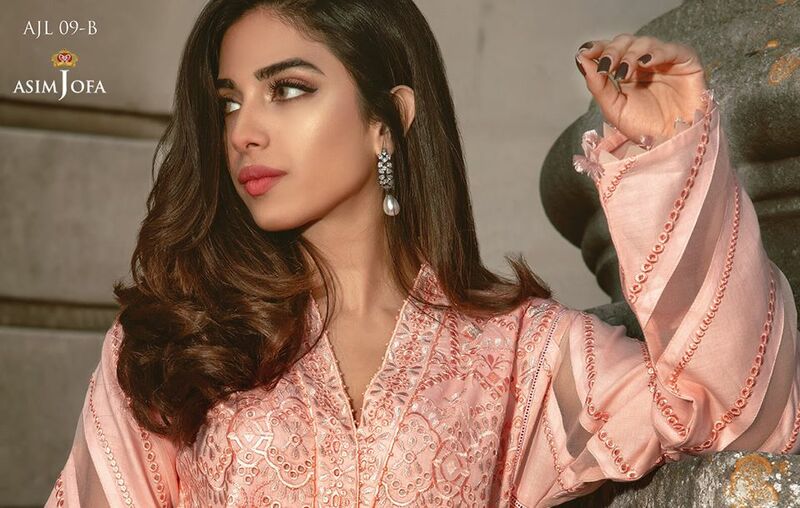 Khaadi specifies its lines as Prêt Ready-to-Wear, Unstitched Lawn Fabrics, Casual Kurtas, Kids wear dresses and men eastern dresses including kurtas and shalwar kameez. Other than clothing it offers women accessories such as jewelry, stoles, shoes, and handbags. This brand is now also engaging with home lifestyles offering furniture, bedding, kitchen products, and bath items. 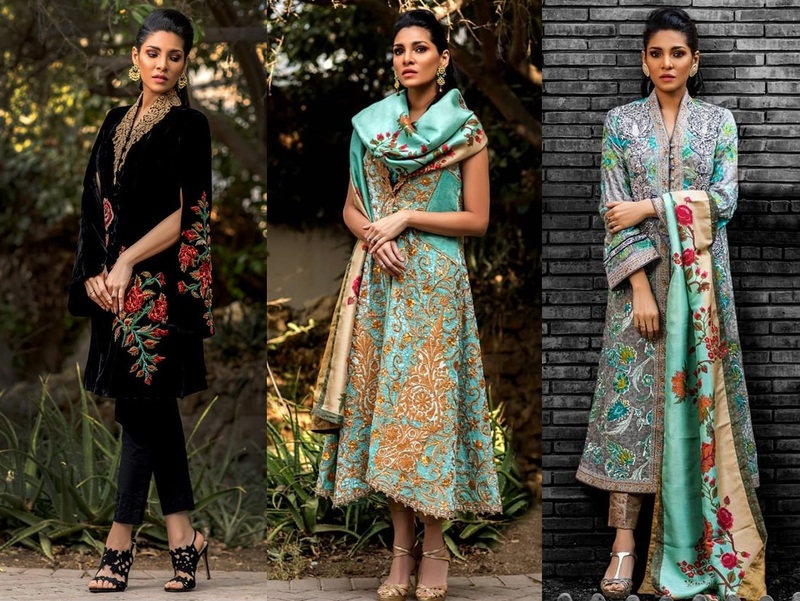 Khaadi produces it’s seasonal as well as occasional collections including summer, spring, winter/ fall, lawn, pret, party wear, casual and formal wears. 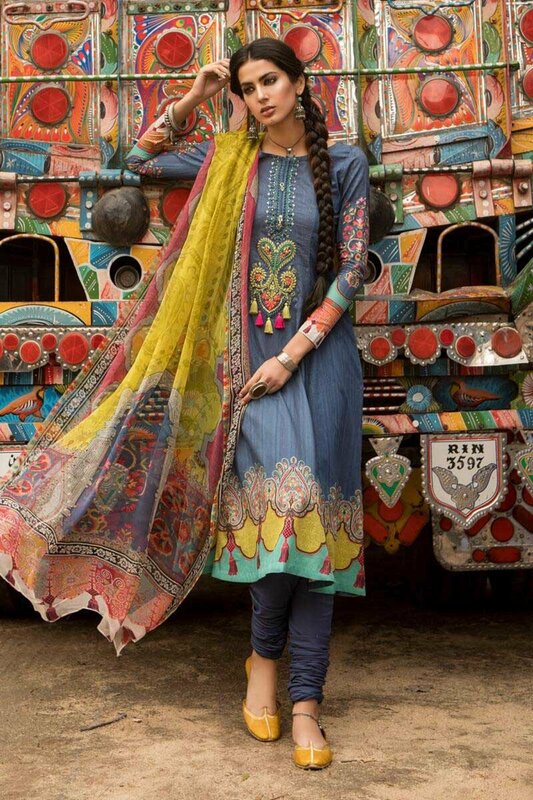 Khaadi kurtas are very popular among young girls because of their spectacular creations. Their three-piece suits are also very popular among working women in Asia. 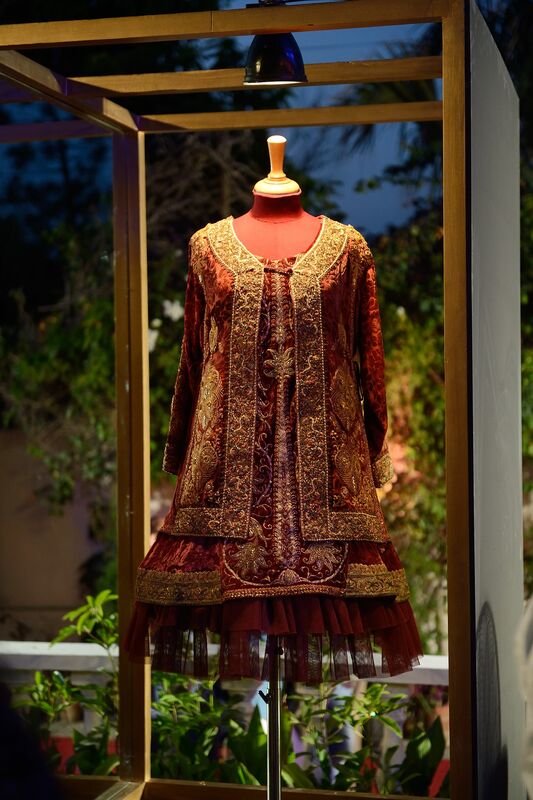 Talking about the “eid collection,” it consists of a variety of formal event wear dresses. Shirts are decorated with floral embroideries and patches at a bottom. The necklines are adorned with sleek embroidery works. 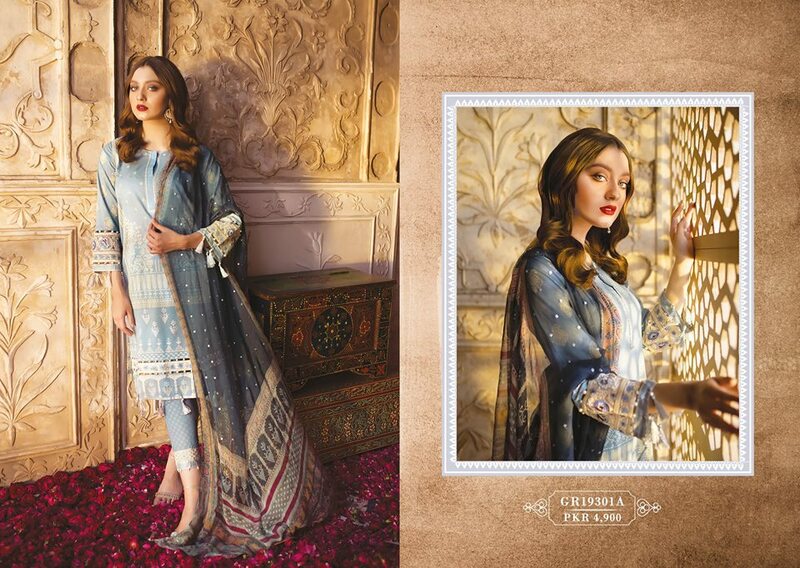 The embroidered plus printed chiffon, silk, net dupattas add more grace to the dresses. 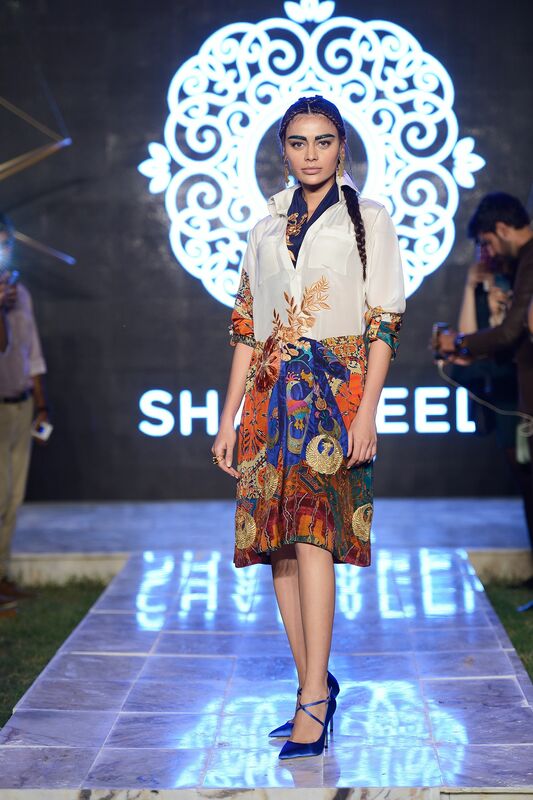 Un-stitched three-piece suits include a piece of the shirt with dyed shalwar and chiffon. The fabrics consist of pure lawn, jacquard patches, and cotton. 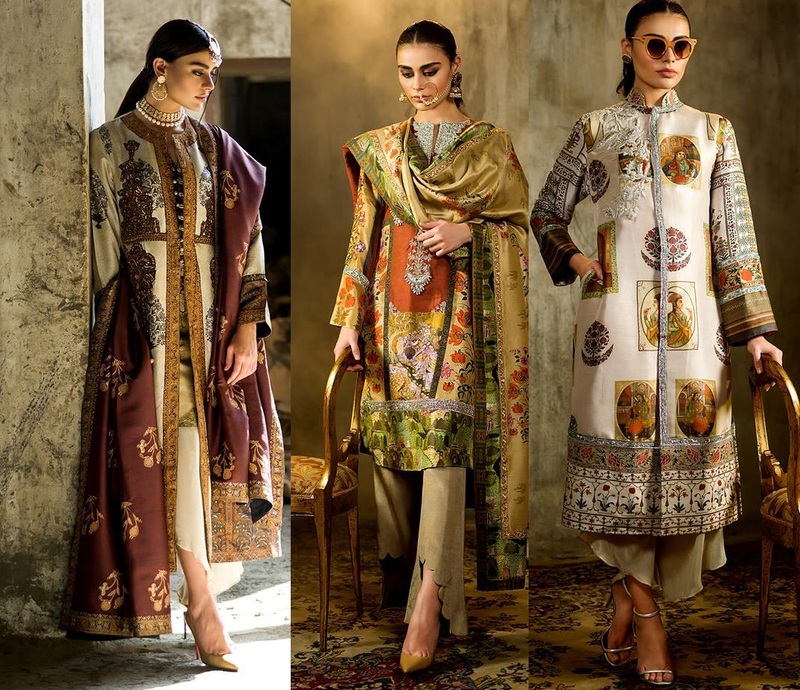 The meaning of Khaadi is “hand-woven”, has remained genuine to its title and proceeds to create a combination of designs to supplement both the eastern and western cultures. This assortment has amazingly embellished dupattas with perfect adorned shirts. The color combination is just mindblowing. You will fall in love with each and every design. 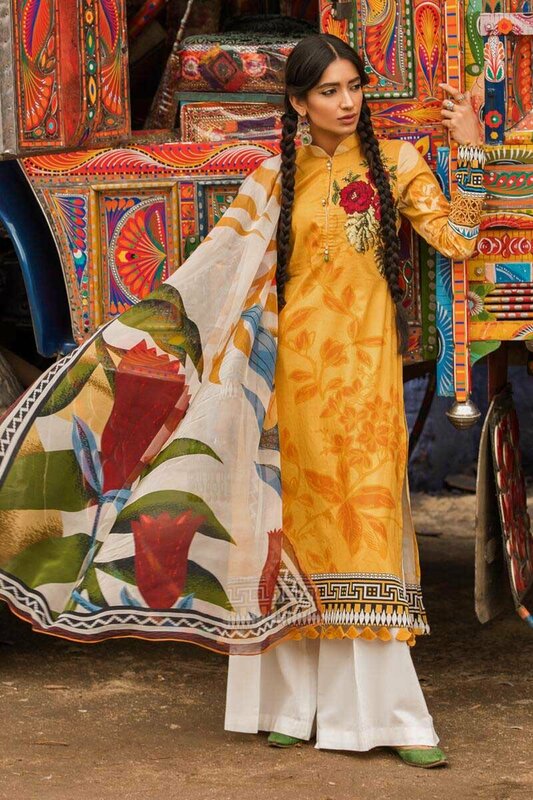 Look at this carrot red outfit having multi-colored embroidery and a gotta embellished dupatta. It is just perfect for this festive season. 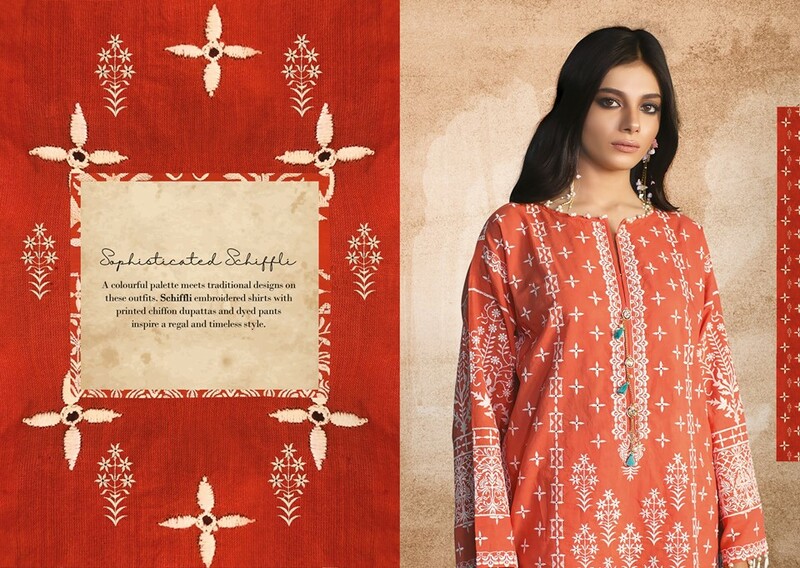 Welcome the festive season with the Limited Edition Unstitched Luxury Collection. Sparked from heritage and finished with a touch of modern accents offering a variety of embroidered fabrics. It has been launched in stores and online. This magenta pink dress with delicate details looks the best for the festival season. Look at this amazing design. The black number having multi-toned embroideries. The stitching style in the picture is soundest. You can make a front open jacket style shirt having inner. Adding some delicate frills around the borders. This fresh lavender pastel toned outfit seems very interesting. Peach and light purple combination having a subtle embroidery looks very fine. Pair it with vintage jewelry to make a style statement. 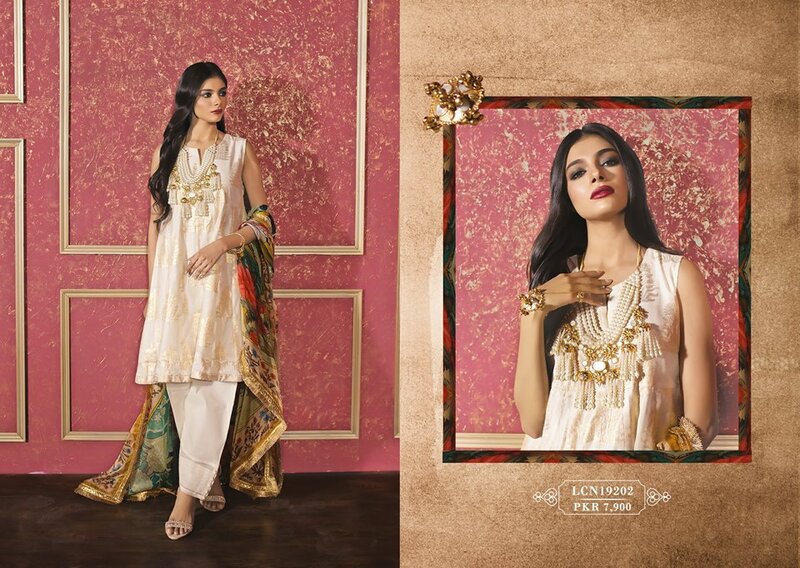 This beige white dress having floral printed chiffon dupatta is one of the best designs of Khaadi Eid Collection. 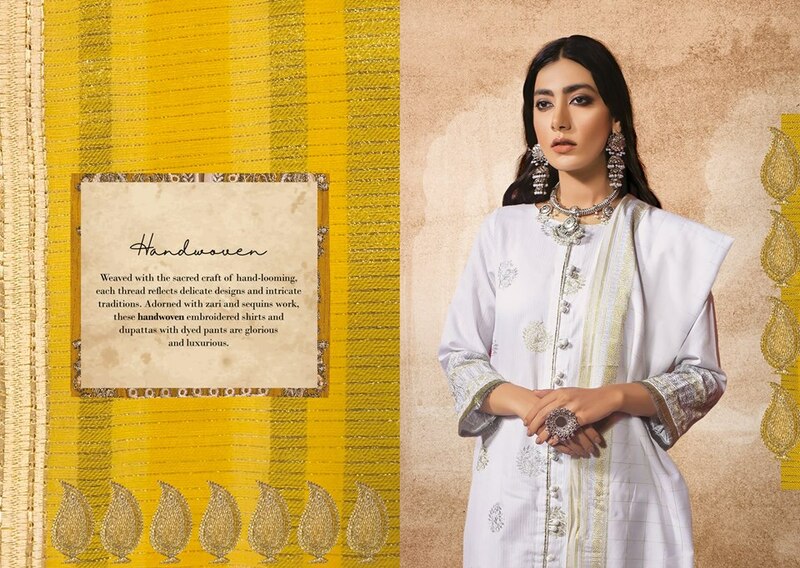 The pretty yellow satin shirt paired with a tissue silk dupatta dyed inner and cotton satin shalwar looks so regal. It comes up with a decorative organza patch to make it fancier. 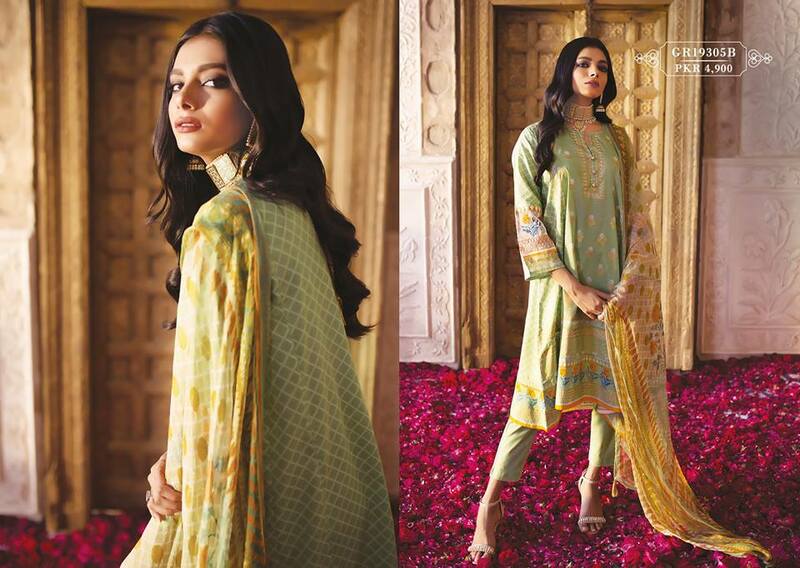 This fresh colors and pastels are competent in this embroidered classic lawn collection. Its price range is 4,900 pkr. 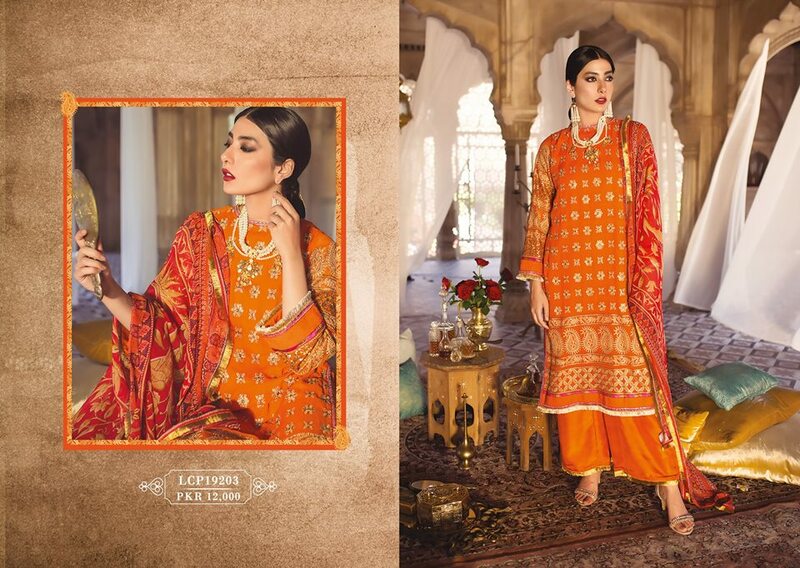 Wow, such delightful dresses are included in this series influenced by the banarasi and kanjivarn. It is perfect for young girls who love to celebrate the joy of Eid. 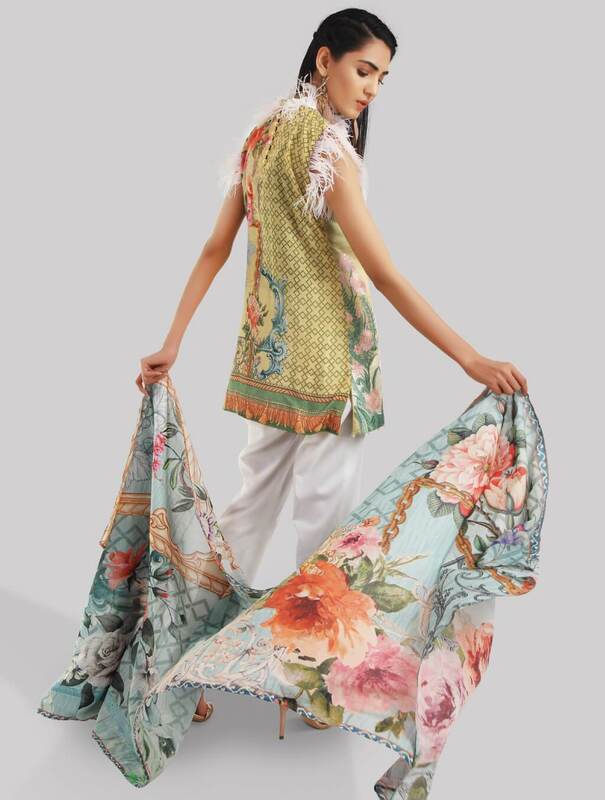 It has a fancy cotton net jacquard shirts with embellished dupattas, cotton satin trouser and dyed inner. As white never gets old. It is regarded as the traditional color for festivals. Plus it looks so decent and trendy. 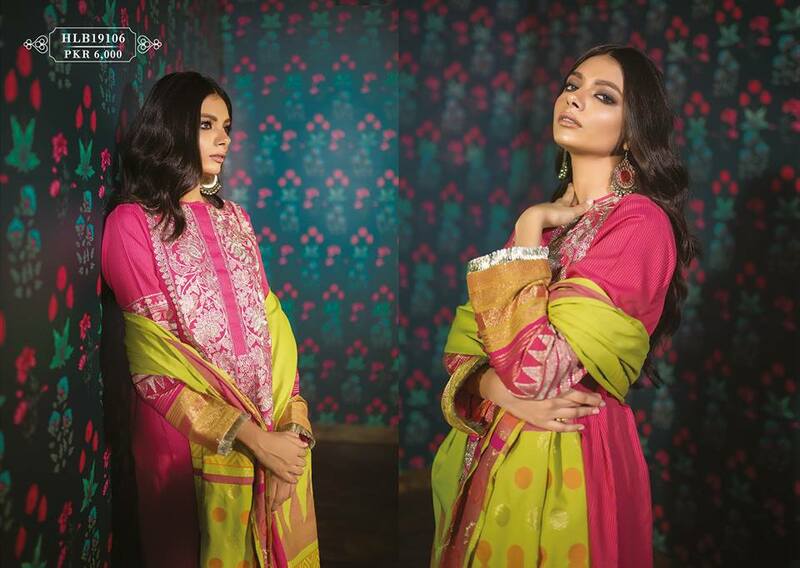 Look at these two amazing designs by Khaadi Eid Collection. 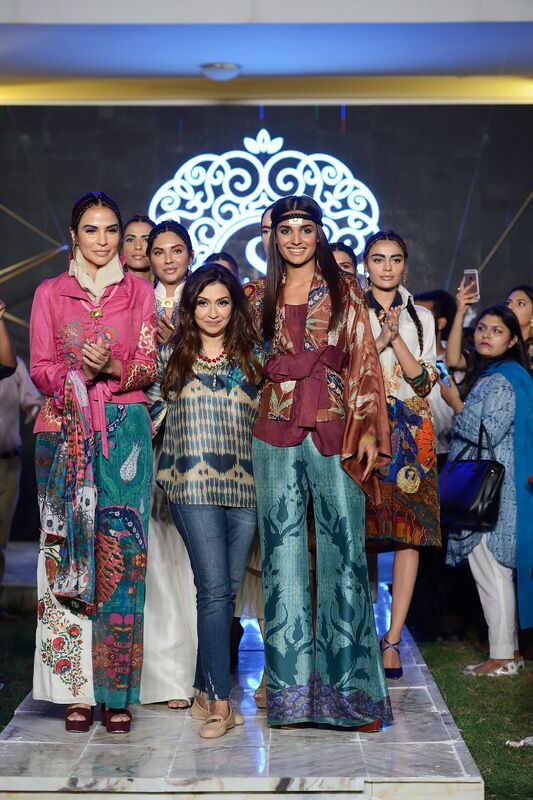 Printed embroidered shirts paired with a chiffon dupattas. They are for 7,900 pkr each. All eyes on this incredibly beautiful pink outfit. You can make an angrakha frock out of it. It comes up with a beautiful embroidered lace. Match it with a khussa and jhumka ballis. 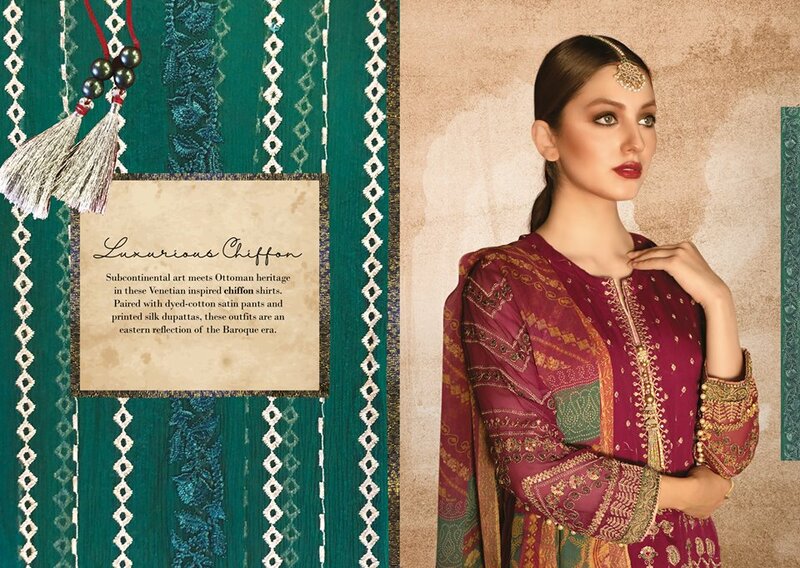 Overall we can say that this luxury assortment is full of festive colors and traditional embellishments. It has zari, Mughal motifs, resham, gotta and sequins finished. All the fabrics used are of very high quality and super comfy. 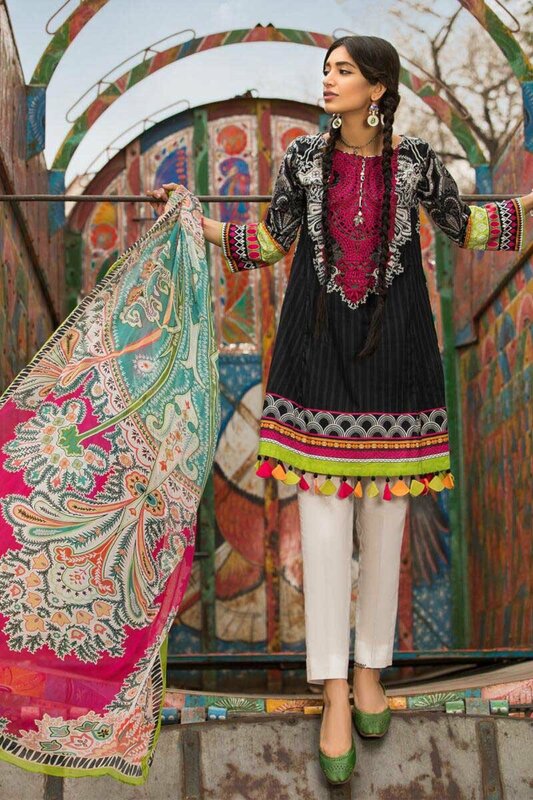 Straight from our traditions, we can see the true spirit of culture and style in these dresses. It describes the pure heritage of sub-continent. Just fell in love with this lavender and white outfit. 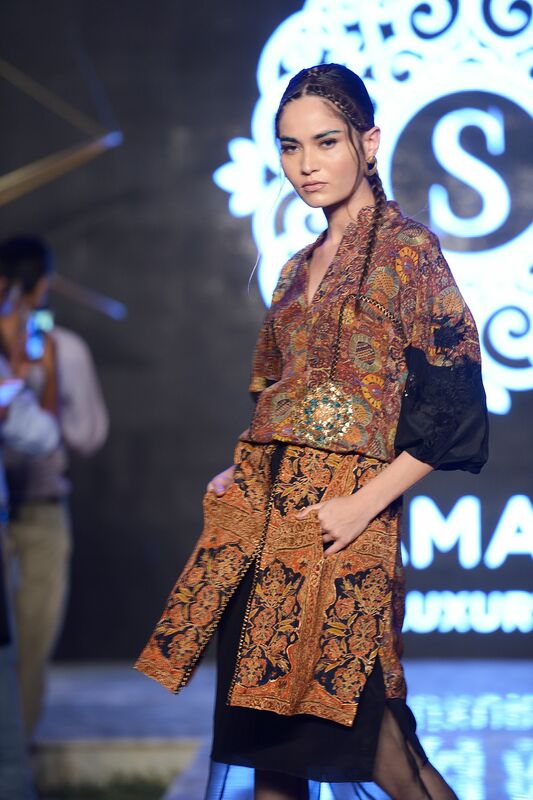 It has classic sleek embroidery on the shirt and trouser bottom. Pair with a Kundan necklace and jewelry. Or just go with the earrings. This design reflects the soft feminine sensibility. Soft florals are meeting the geometric patterns to give a legendary yet elegant look. Celebrate the pleasure of celebrations with this wondrous dresses collection. Khaadi never gets compromised on its quality and maintained the reliability as premium clothing exporter in all over the world includingIndia, Bangladesh, Arab Emirates, London, America and many other countries. 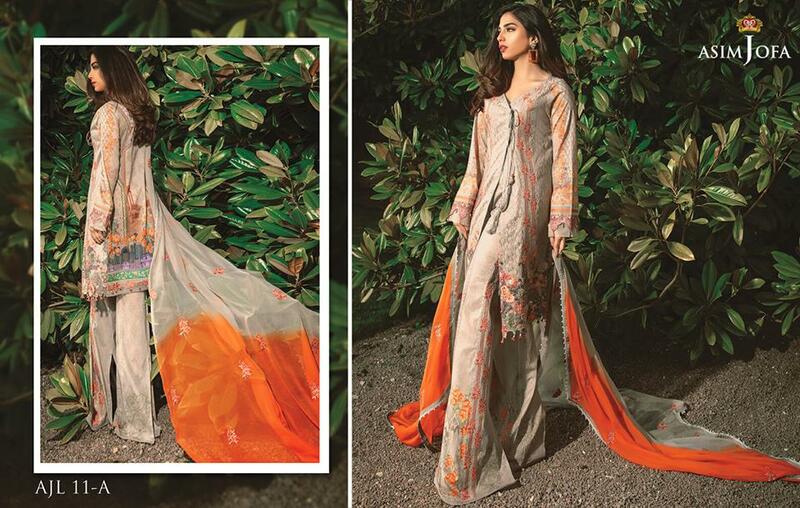 The handwoven three-piece lawn suits are the main part of Khaadi Lawn Chiffon Eid Dresses collection. 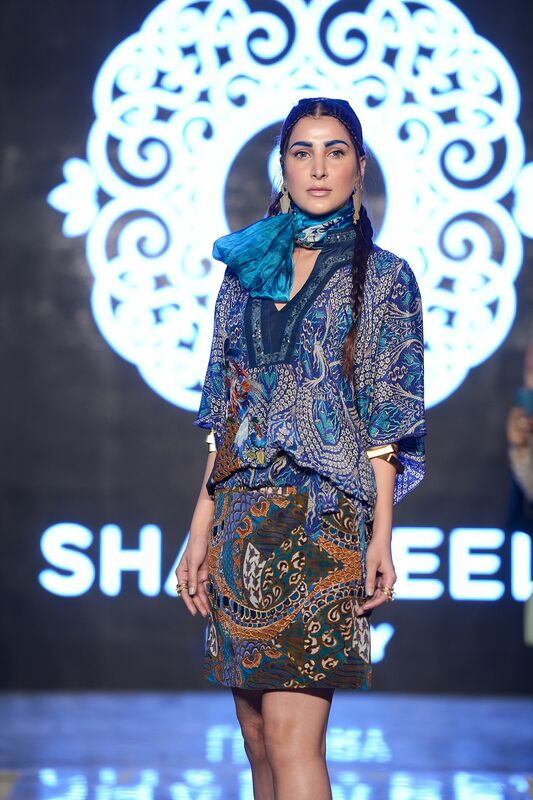 That means long and medium length trendy shirts paired with trousers pants along with silk/ chiffon dupattas. You can buy these suits online or visit the nearest outlet. Make your events more fashionable by wearing Khaadi. 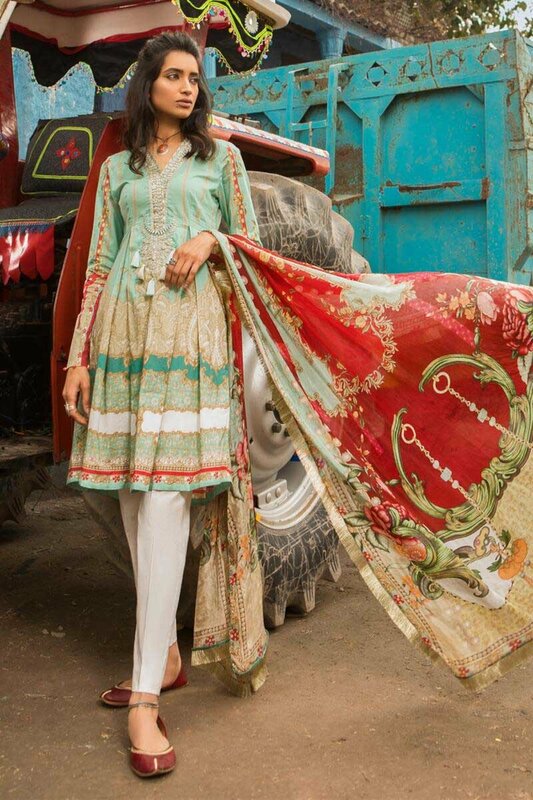 Have a look at the Khaadi Lawn Chiffon Eid Dresses below and get inspired by the latest designs. Keep following us for more fashion stuff. Hey, Ladies! today I am here with another enchanting lawn assortment of the season. The name itself needs no introduction. 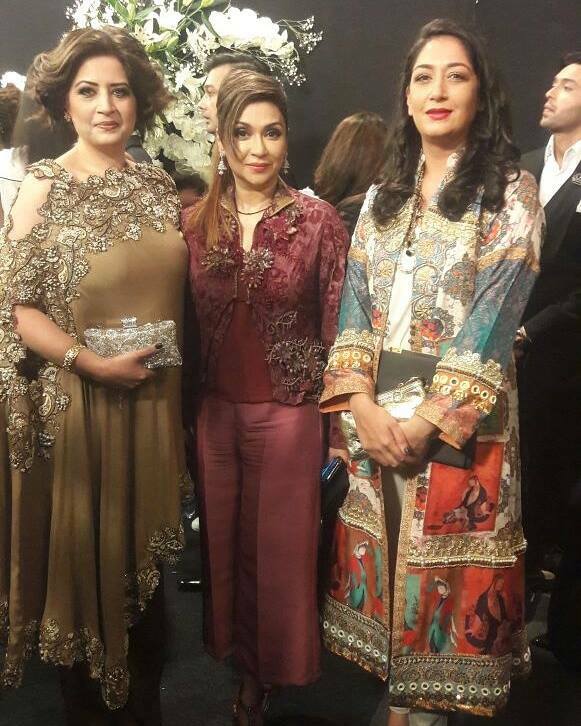 Asim Jofa, a shining star of our Pakistani fashion industry is one of those big names who has earned huge fame in a very short period. The brand was introduced in 2009 & shined like a diamond, as a diamond is shining, attractive and enhances the beauty of the person wearing it. 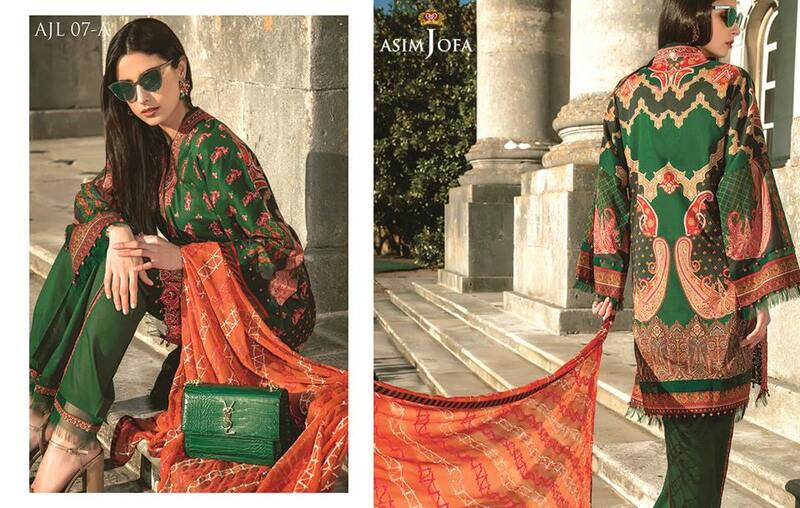 So wearing Asim Jofa will definitely show your status symbol and elegance. Since then, it’s collections has got a huge response from the customers. Not only nationally but also at international level. 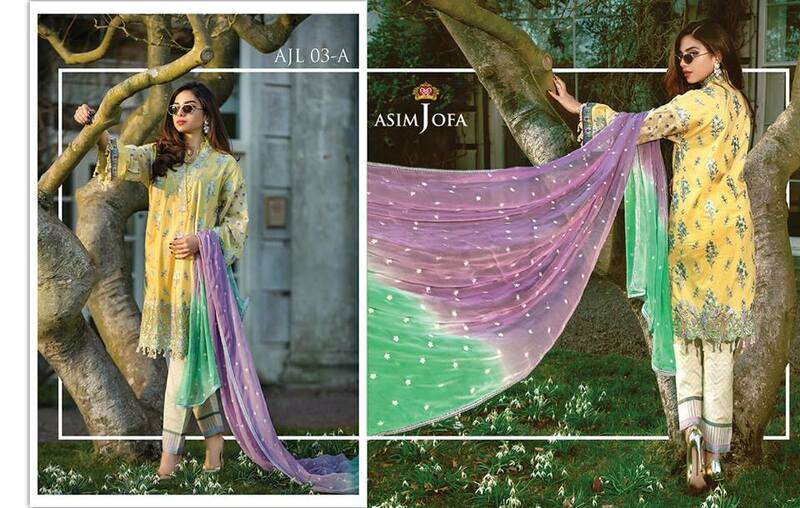 Today we will discuss the latest Asim Jofa Printed Embroidered Designer Lawn Dresses Collection 2019. 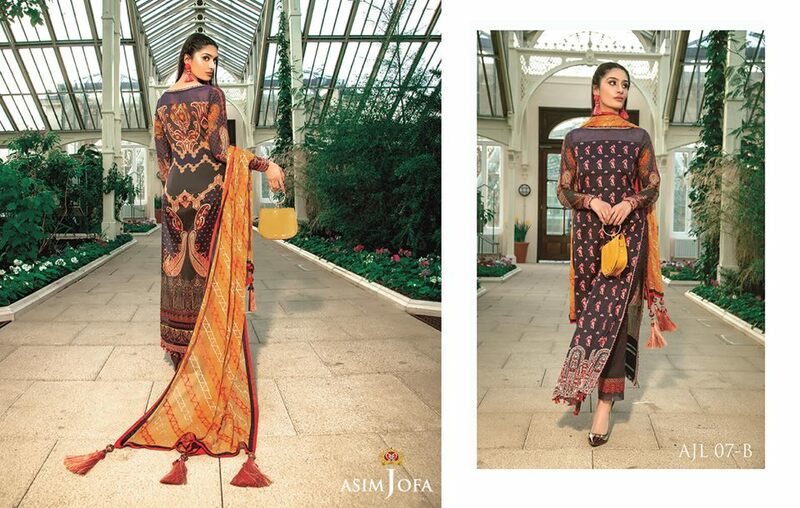 Asim Jofa Lawn Collection is now released and has made the biggest splash all around. 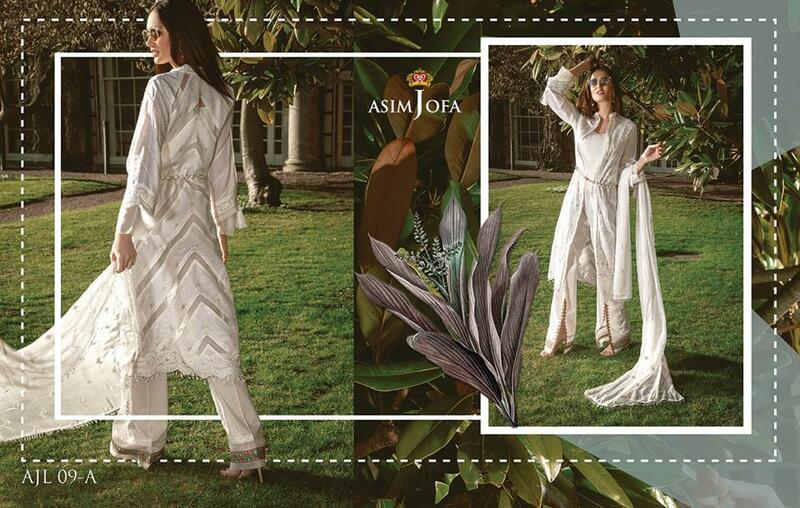 Asim Jofa Lawn is a very reliable and sincere product line that is why it is highly appreciated by the women. 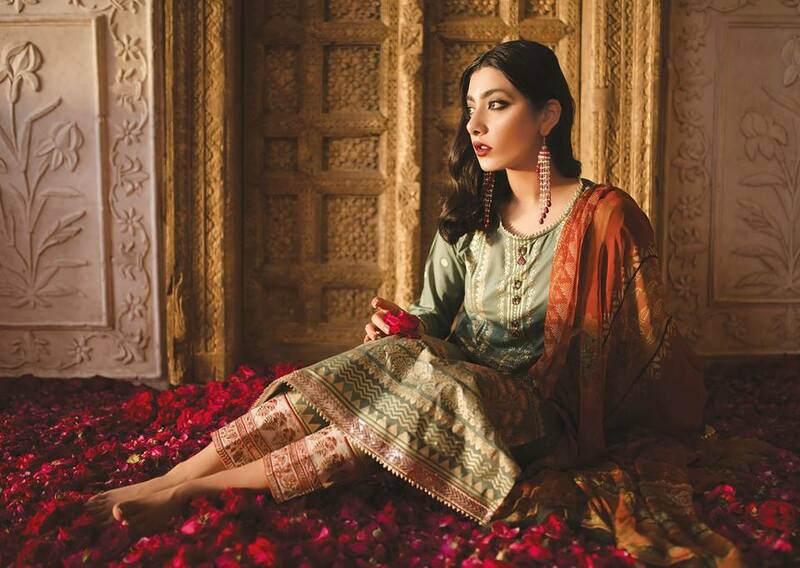 Asim Jofa is famous for its unique luxury patterns and embroideries that looks very interesting to wear. Rejoice your summer spirit with this dazzling combo of monochromatic color tones and tastefully done digital printing. Pair it with cool accessories to get your look on point. If royal is the look you are aiming for then you have reached the right place. 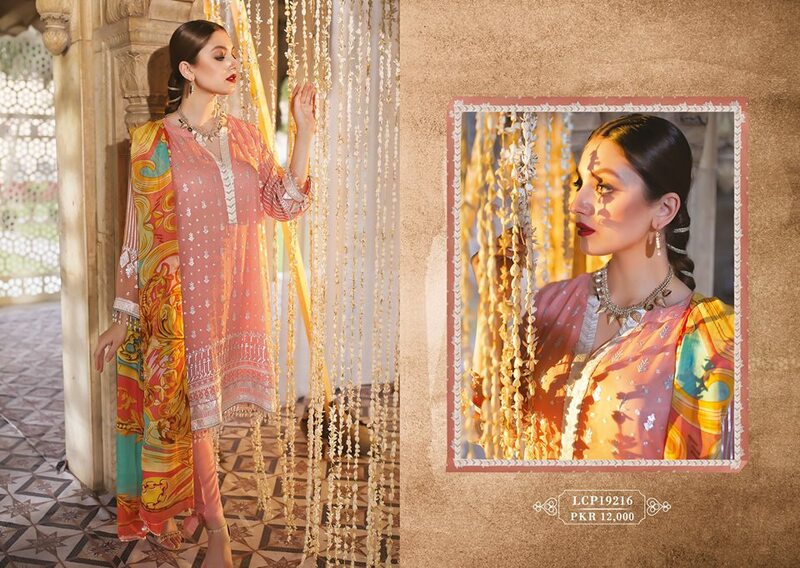 The beautiful adorned and printed masterpieces with all the warm rustic hues and elaborate embroidery are just the perfect thing for you. 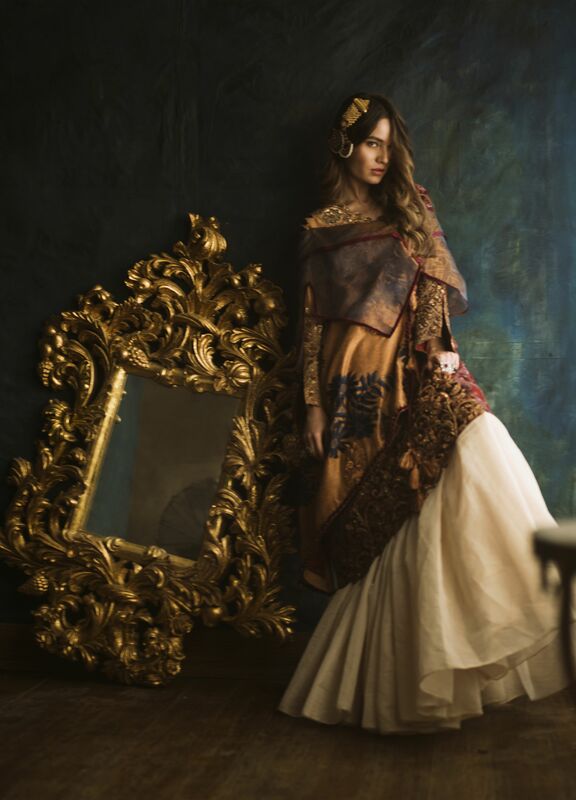 Baroque inspired luxurious prints are also part of this assortment. They are accentuated by delicate embroidery oozing elegance. The luxury lawn summer dresses collection is a combination of fresh colors like white, peach, black, orange, pink, purple, green, yellow, etc. and strong effect of lawn prints that impress every fashion lover. 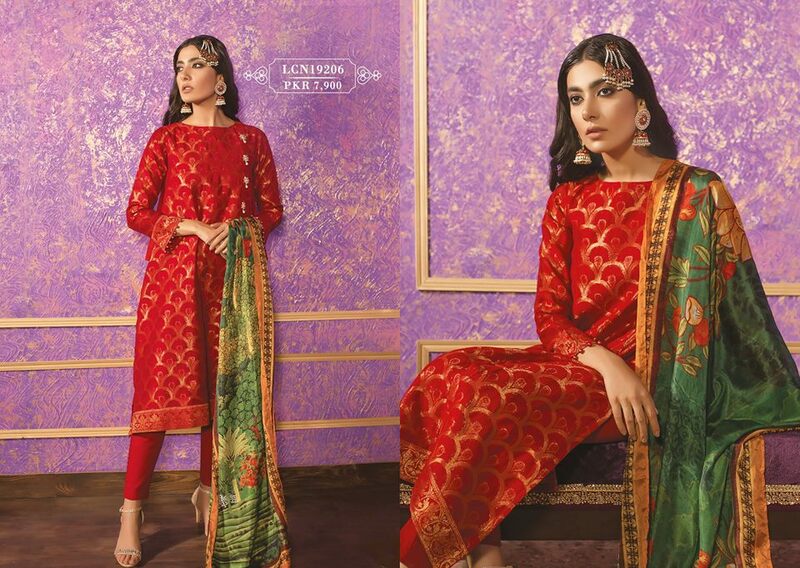 Three piece suits are available with shirt, trousers and chiffon dupatta. 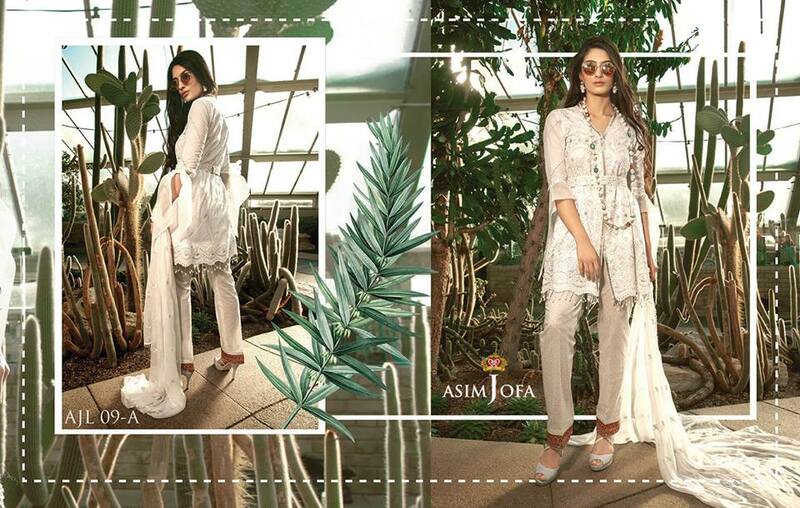 Asim Jofa latest lawn collection 2019 is full of charismatic touch. 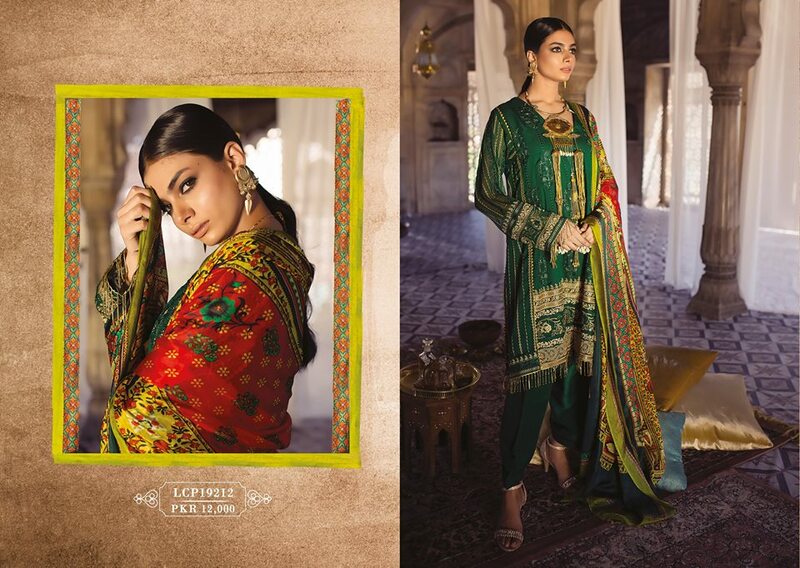 Show your true elegant side with these ensembles of regal colors and remarkable prints that easily evokes the royal era. The shirts have embroidered neckline and border that hits the final nail into the grandiose. 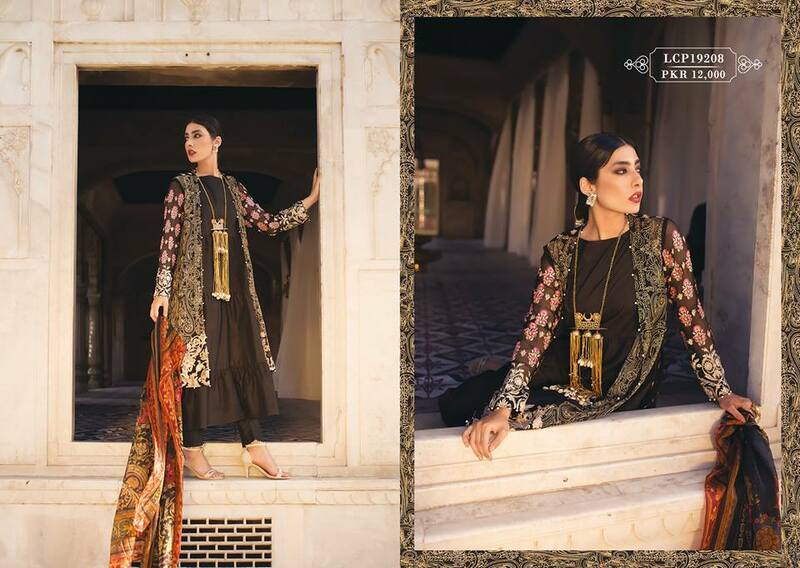 Self-indulgence is great especially when it comes in the form of this ensemble rich in ethnic colors and intricate embroidery. 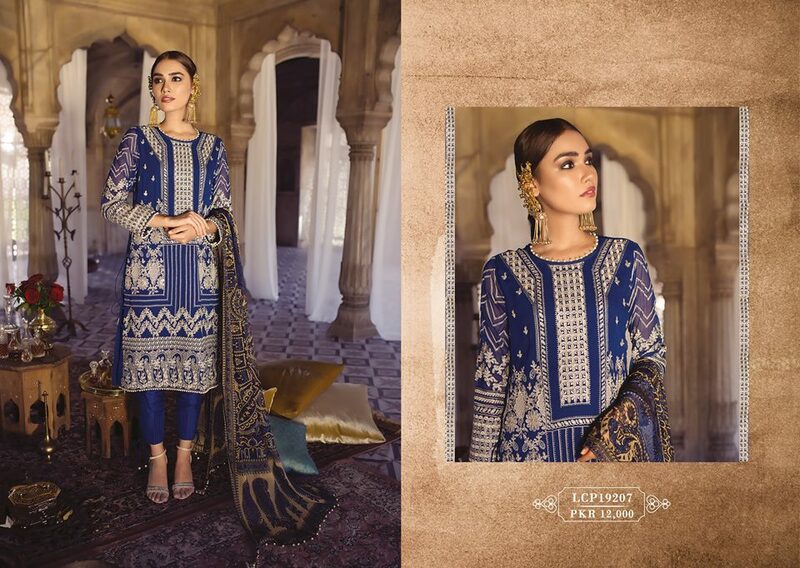 The embellishments with the bold anchor embroidery with Aari Tanka and sequin in harmonious tones make the suits more summery and elegant to wear. A technique which has been given an entirely different perspective to the viewer. Boring technique on architectural elements along with fuchsia floral foliage running over blueberry blue base enhanced with Pani Sitara creates a surreal delicacy which adds exclusivity to this design. 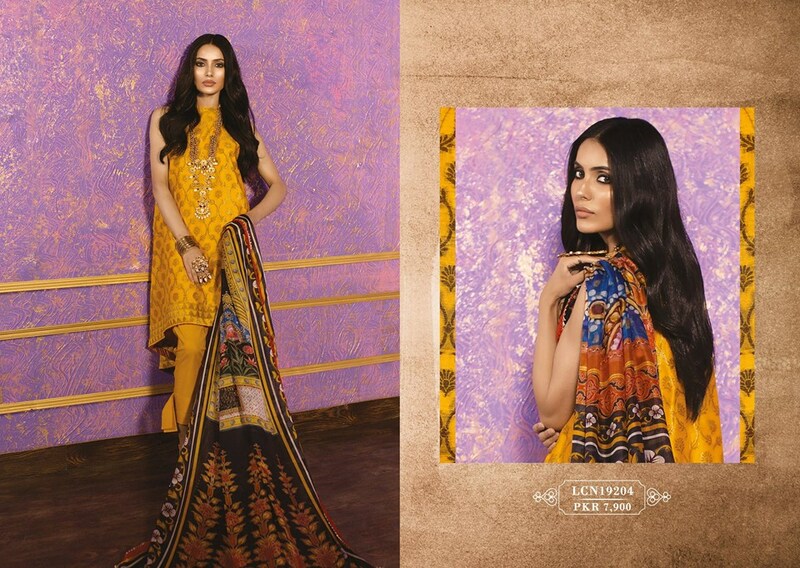 Printed pants with complimenting printed border and two-shade embroidered chiffon dupatta add refinement to the suits. 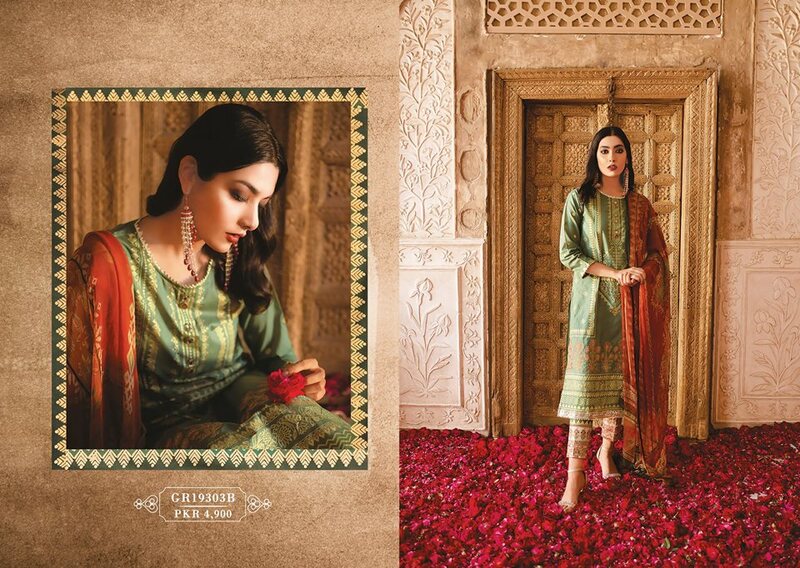 inspired by contemporary pattern and vintage design narrating bold color anchor thread embroidery and Aari embroidery on pastel colors for those who love fashion at its utmost level. Making a very strong statement for looking fashionable every day. 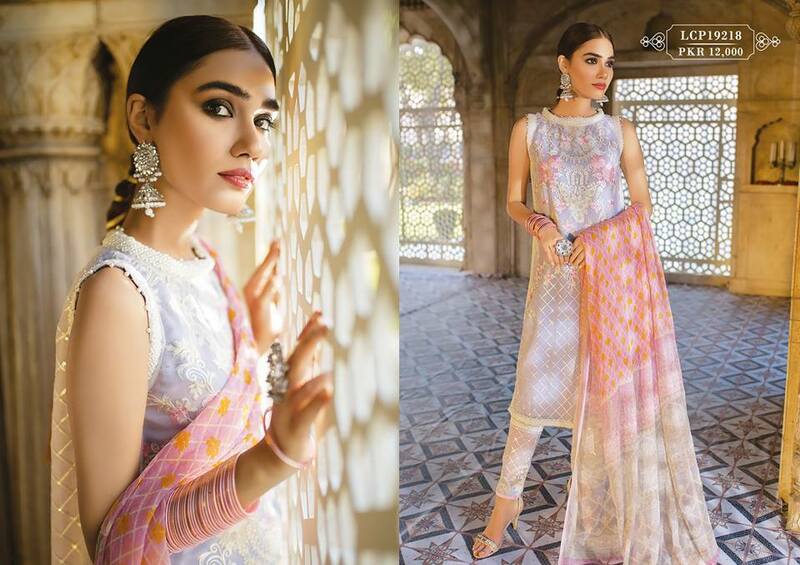 The creamy off-white sets the ground for this design inspired by baroque elements and floral hints complemented by delicate tracery in thread adorned with pearls and transparent sequins and two-tone dyed knitted dupatta this ensemble will surely have you entranced by its tranquil beauty. Ravishing white, a must have designed to your closet, Chic fabric with the opalescent white on white engraved boring technique to combine and create the smoldering style statement for your 2019 summer. 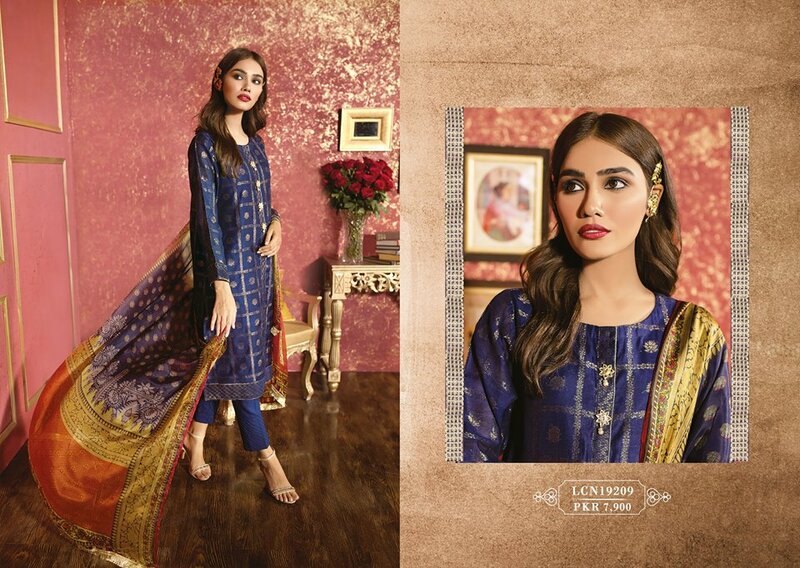 Paired with white self-printed pants and all over patterned chiffon dupatta. 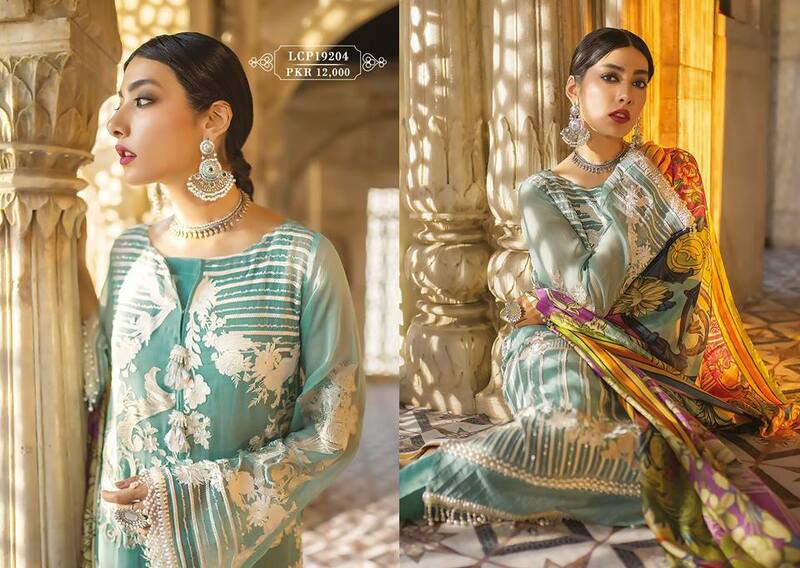 Cool mint green color exudes elegance with this chevron embroidery on the net with thread and zari combined with anchor embroidery add-ons and embroidered dupatta. This design will surely make you stand out. 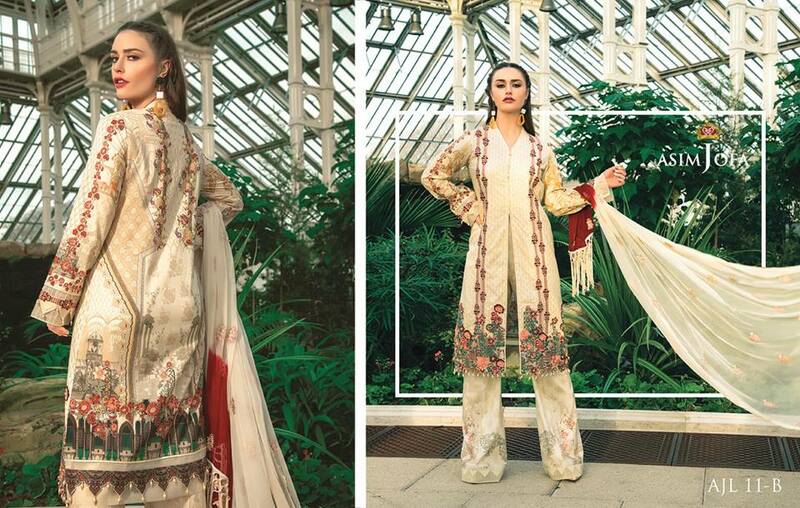 Comprising of traditional embroideries and floral patterns. While touching the high ends of modernity. 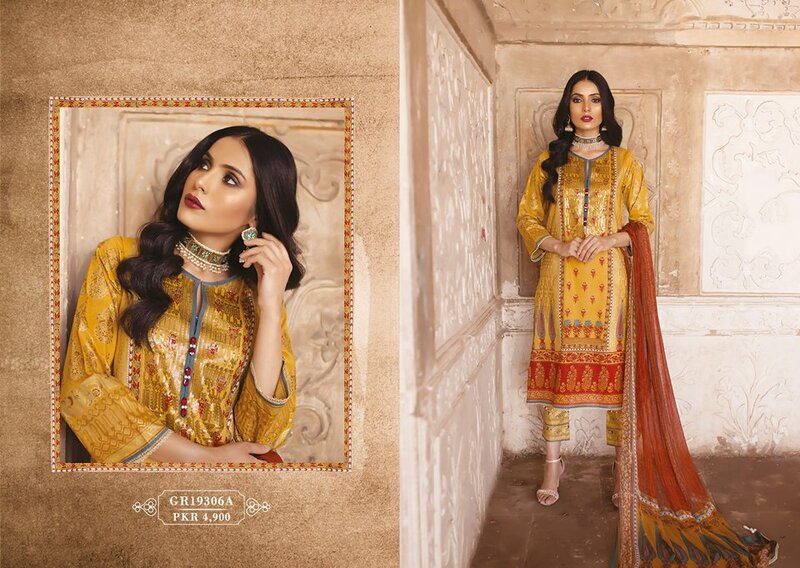 These dresses are available in all outlets of Asim Jofa in Pakistan as well as it is available online for national and international customers. Have a look at these incredible luxury lawn designs and get inspired. shop your favourite pieces before the stock runs out.